Hands-on review of Joomla and WordPress themes and plugins. If you are working in joomla web development business, then you must know the importance of a template. Template helps you to develop your site very much faster than the regular method. As the different sections, styling, and options are offered with the template; your precious time is saved. Templates do half of your work, but you do not get all of these Joomla templates free of cost. There are two types of templates, Joomla free templates, and Joomla premium templates. Premium Joomla templates are those templates, which you have to buy and often comes with more features than the Joomla free templates. Rest is free Joomla templates. Joomla free templates offer many customizations, styles, pages, options and other features. Magnificent websites can also be built with free templates. Now you might be thinking, What is the difference between Joomla free templates and Joomla premium templates? Actually, premium Joomla template comes with some extra elements or features and support. Those are generally not provided with free Joomla templates. But it is also true, you can build professional website with free Joomla templates. When you come up with an initiative to start or expand your online business, many factors seem to drive your decision. The time and the budget seem the most influential among many. Even these two factors can sometimes lead to make your decision quick and inexpensive. If tight budget and short timeline satisfy your website needs, “FREE” could be your word of choice. There are numerous Joomla! FREE template out there on the web, but it’s hard to know where to find recent, responsive, trendy and a template that suits your need perfectly. If you are thinking about downloading Joomla templates free, then you are at right place. To help you find the right free Joomla 3 templates and save your time, today I am presenting you some collection of best free Joomla templates. This best free Joomla templates 2018 will provide you great starting platform for your online business right away. Feature & Design: At first I have checked for features in these free Joomla 3 templates. The more features are available, the more customizability options you get with the Joomla free template. At here selected Joomla free templates comes with both enriched features and designs. Popularity & Reviews: Good templates comes with great reviews and often more popular than other templates. In the list of top free Joomla templates, all the templates come with good reviews. Update Frequency: New features and functionalities are released with updates. So it is a must to check the update frequency. Looking for a Joomla template, with different beautiful layouts, several built-in pages, lots of elements and customization? Well, you will find a lot of paid templates but if you need to save your pocket then consider yourself lucky. 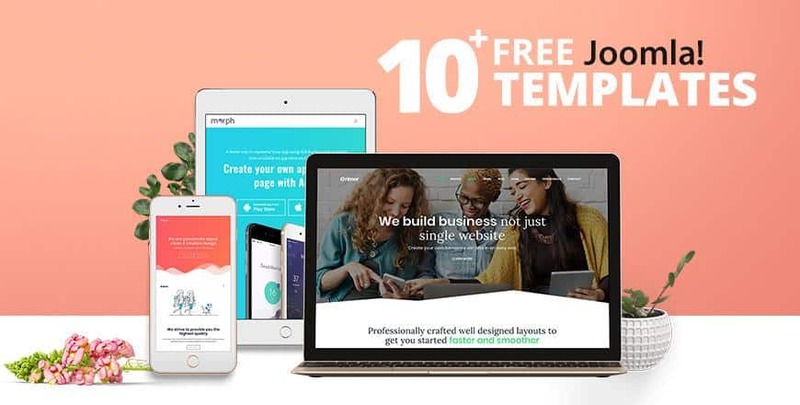 Morph is here to fulfill all your requirements, and it's absolutely free. Morph is considered as one of the best free templates of 2018. It is built with popular T3 framework in its core with Bootstrap 3. Your website you choose how your site will look. Morph provides you, your preferred menu - Mega Menu, Off-canvas menu, navigation menu and drop down menu. Typography is a necessary term for a website to ensure flexible readability. Morph gives extreme control over typography with 100+ google fonts. 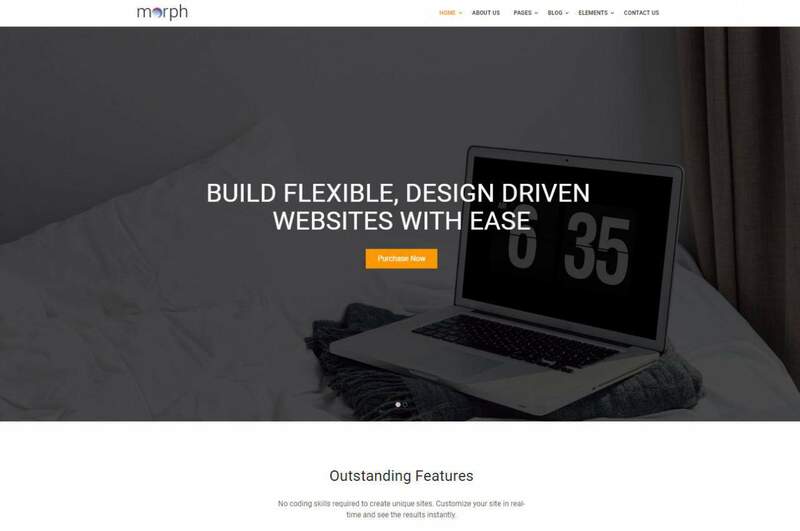 Create modern business, agency, portfolio and other types of sites with attractive layouts of Morph. More than 50+ Quix Elements. Zenith II is 100% responsive Joomla free template with lots of outstanding features. If you are looking for a free template to build your business site, then Zenith II is the perfect template for you. Zenith II is shaped with popular Bootstrap framework in front end and T3 framework in the core. This template helps you to build professional sites very easily as it comes with Quix Page builder. With Quix page builder you can customize your site in any way, you want. Quix’s 50+ elements allows you to mix your imagination with Zenith II. With Quix sky is only your limit. Extra pages means less labour and you get team, service, FAQ, testimonial & other pages with Zenith II. Tie up your large amount of information easily, as Zenith II comes with 2 dimensional Mega menu builder. Don't worry if you are using Zenith II on different devices, because fully responsiveness along with off-canvas menu. With Off-canvas menu you get the menu options in small screens and other devices. Purity III by Joomlart is one of the best responsive Joomla free template that serves your website need enormously. It is a multipurpose Joomla template that allows you to develop simple to complex, personal blog to professional business portfolio or any type of Joomla websites. And the best thing is you do not have to invest a single penny while developing your site with Purity III. This template is entirely responsive and built with T3 framework in core, which can be tailored with any viewing devices. It doesn’t matter which device your client is using to browse your site, it will always look perfect. Purity is highly compatible with with most of the third party extension available in the community and one can easily customize with layout configuration or ThemeMagic. It offers you several gorgeous layouts like corporate, magazine, blog, portfolio, glossary and many more. This template also offers you to choose custom layouts. Select your preferred typography color and style to develop your ultimate Joomla website. Highly Compatible with 3rd Party Extensions. Support to RTL Language Layout. 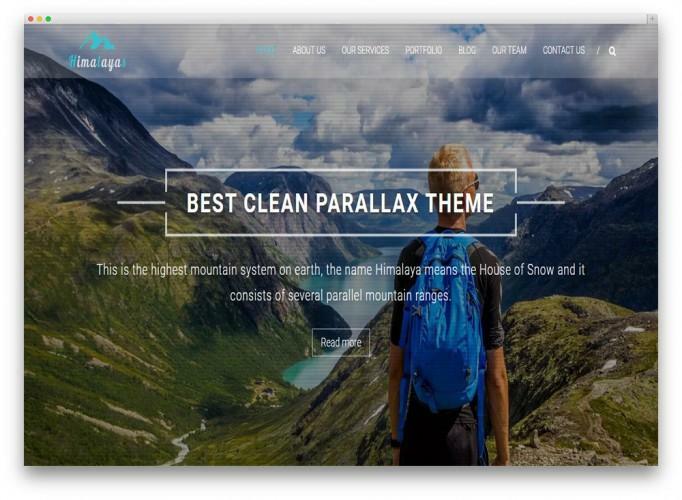 Helix Ultimate is not just any regular template, it is a universal Joomla template which can be used to develop any sort of websites. This template is user friendly and highly customizable as it’s core is built with Helix framework. You can use this template to build website for consultancy firms, businesses, insurance companies, portfolio, online shops, book collection, traveling updates and many more. Bootstrap 4.0 is used so that you stay updated with the latest technology. Designing got a lot of easier with Bootstrap 4. You will find full freedom while developing with helix ultimate, for which you have craving till now. Helix ultimate template gives you mega menu builder which will help your users to access a tot contents on your site within the menu bar. To increase the readability of your site you can set custom typography with changing font, size, margin padding, and etc. Anything is possible with Helix 3, you are just limited by your imagination. 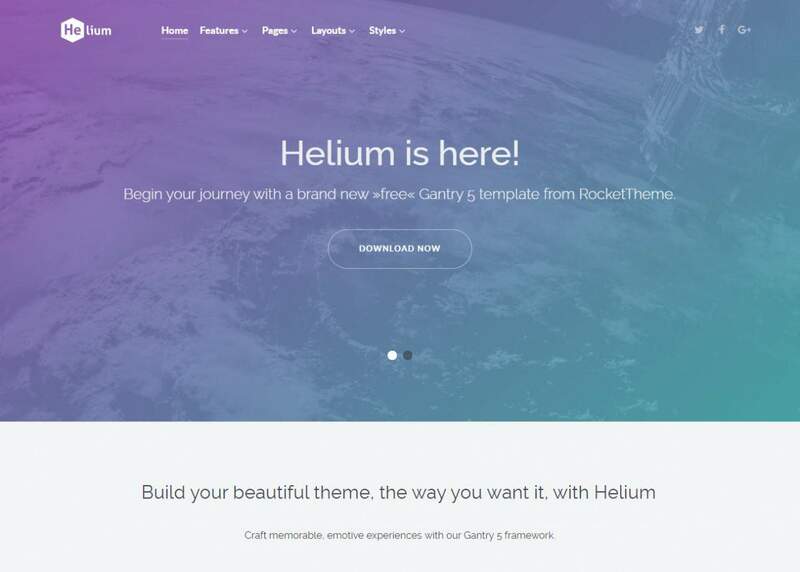 Helium is a free template powered by Gantry 5 Framework. This template provides 6 presets with easy configurable header, footer and menu style. Therefore, you can make your desired website very quickly and customize easily. Helium comes with layout manager, which makes it very easy to customize with just drag n drop. Besides you can easily load all the presets with the layout manager. Every step you make to your build your site is recorded, so you can undo and redo just within a click. Helium includes powerful menu editor which makes module & particle inject, menu organization and visual enhancement a breeze. You get all of these functionalities and feature at absolutely no cost. 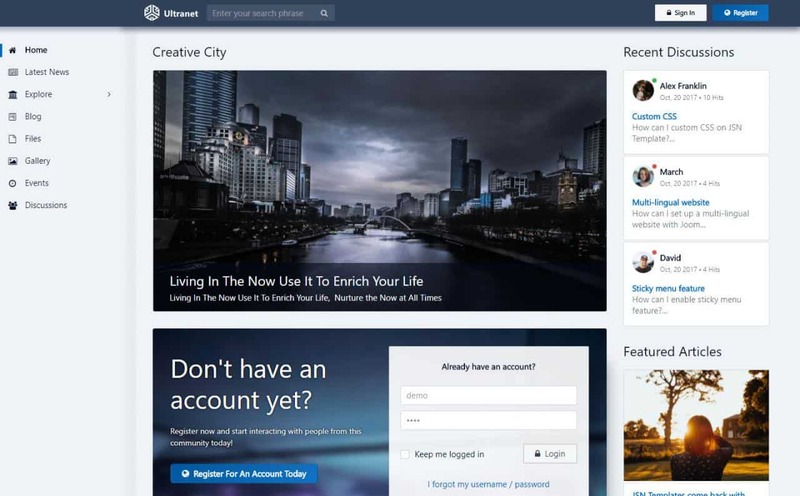 JSN Ultranet is a quick responsive template, which is designed especially for intranet website. Build your business site very fast with JSN Ultranet. 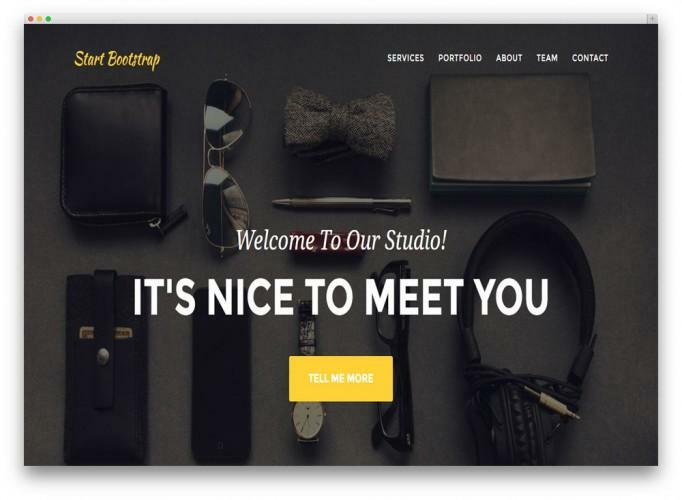 This template gives a stunning look to your front end and makes your website more professional. JSN Ultranet comes with stunning RTL supported layouts. Responsiveness is filled in every part of JSN Ultranet; therefore it looks same on all devices. This template is powered by Bootstrap 3 and Sun Framework in the core. Sun Framework allows you fast saving without reloading your page, and you also get to import & export all of your template setting very fast same as the demo site. The requirement of everyone is different, for this reason, JSN Ultranet is made with rich features and easy customizability. To help you out sample data is provided with the template, just hit install sample data and make your website colorful you get six color variants, choose one that fits best. You also get several menu styles with JSN Ultranet. JSN Ultranet also supports different SEO friendly and provides RTL support. There is no exception, except experiencing yourself. Forte is a free template with a lot of exciting features and build with Vertex framework. The clean design of Forte adapts to most kind of websites. Forte offers customized S5 image, content fader styling, custom highlight color, hide sub arrows, custom font options, enable or disable uppercase letters, adjust background & row colors and much more. 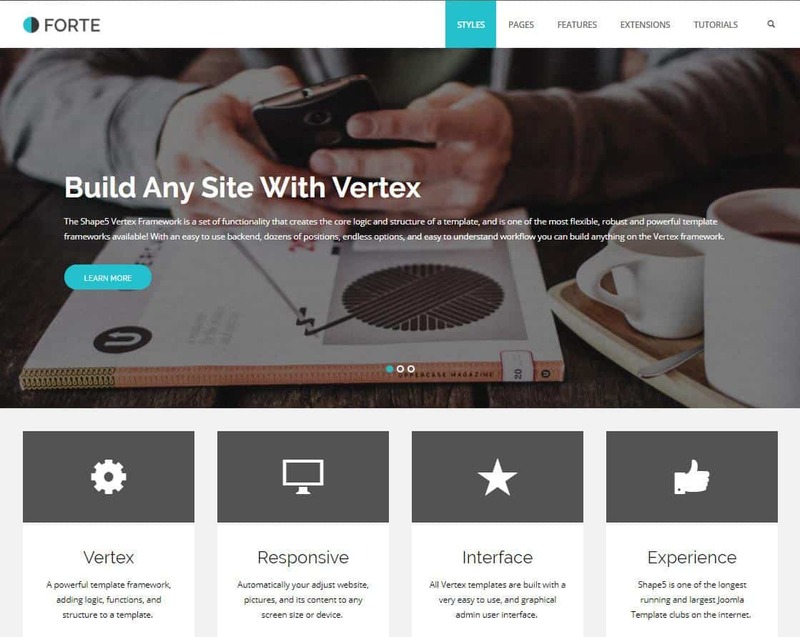 Vertex 2.0 gives you fully responsive website with options to enable or disable a responsive layout feature. You can use both fixed and fluid layout to ensure extreme flexibility on your site. With Forte, you can also hide areas or sections, which you do not want to show on mobile phones or tablets. Magazine is one of the very popular Joomla free template for professional news portal and bloggers. Easily build modernly styled blog within shortest time with Magazine. The power of News Show pro and tabs module enhances the experience of magazine far more better than other template. Give the stage for your blog, with features posts in the main body of the page. It's totally up to you to decide how many posts you want to display. Without worrying about layouts keep writing your blogs. To keep the content creation process simple GavickPro has added K2 support and Gavern framework. With Magazine template you get extra style options such as layout options, color-switchers and more to add an extra layer. 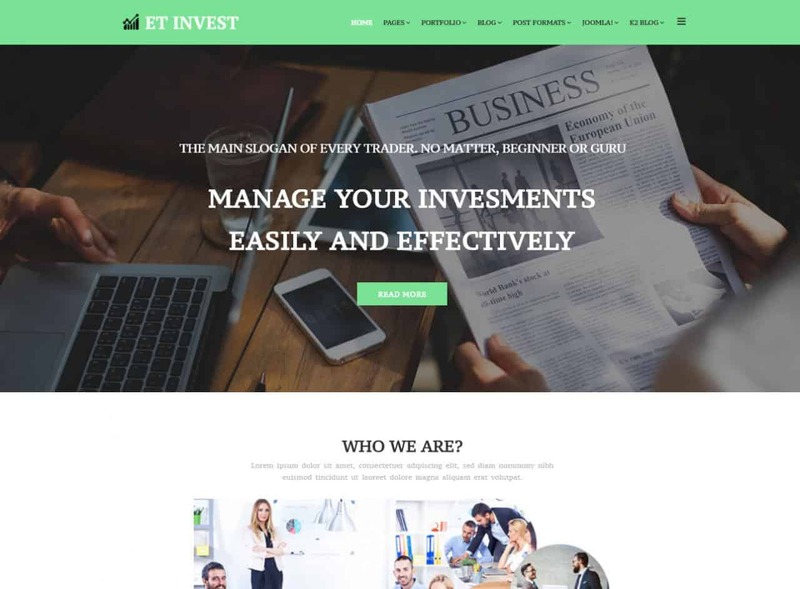 Et Invest is one of the best free business Joomla template from Engine templates. This template comes with 4 colorful layouts. You can choose any layout you want and customize more the way you want. Everyone wants simple, clean templates with lots of features. Et Invest is made by keeping these concerns in mind. It's very much easy to customize the template as all the functions are very simple. The specialty of Et Invest is, it lets you make a lucrative professional website in a very short time and at full free of cost. From top to bottom, Et Invest is responsive. It is fully optimized for modern devices like iPhone, Android, tablets and other devices. SJ News II - A news/magazine template based YT Framework V3. This is a Joomla 3.x template integrated powerful K2 component. SJ News II is built with powerful mega menu and clean coded designs. This template allows you to present your content in a creative way, where designs blend perfectly with your ideas. 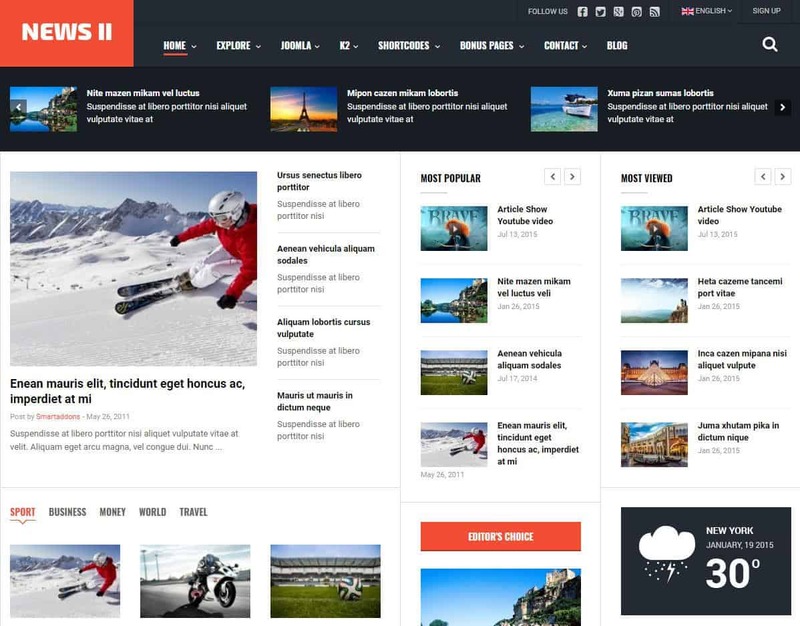 You will be able to make perfect news/magazine, sport, blog and corporate websites with SJ News II. This template provides you 8 modern color styles with full width and boxed layout. With SJ News II, your builded site will show same on all devices as it is fully responsive. You can use RTL language layout in your site, as the RTL support comes with SJ News II. Sometime free Joomla templates are not enough. We need more features and functionalities, which are only provided with premium Joomla templates. So I have also listed 5 best premium Joomla templates. If you are looking for 2018’s no 1 business template, then stop looking around and check Primer. Primer allows you to create professional business one-page template within very short time. Primer is developed with amazing features which lessens your hard work. Primer is powered by Quix 1.9. Create and design pages just by drag n drop as quix does everything for you. You can create your site by loading the default sections in primer. If you would like to modify yourself, 50+ Quix elements is there for you. Use your imagination and make your site with Primer and Quix. 3 stylish layouts -creative, business and cryptocurrency layout comes with Primer. Each has specific professional designs and organized differently. In the cryptocurrency layout of Primer, you get coin converter. Convert popular cryptocurrencies in your local currency in just one click. Select two currencies and click on the convert button. Responsibility is filled in every potion of the Primer. All the layouts of primer are fully mobile responsive and adapts any display size. So your size looks absolutely perfect on any type of devices and displays. Typography is one of the essential features of a template and Primer gives you typography control with RTL support. You have 1000+ google fonts, choose the one that is perfect for your site. RTL support allows you to make RTL sites for languages like Arabic, Urdu and other. 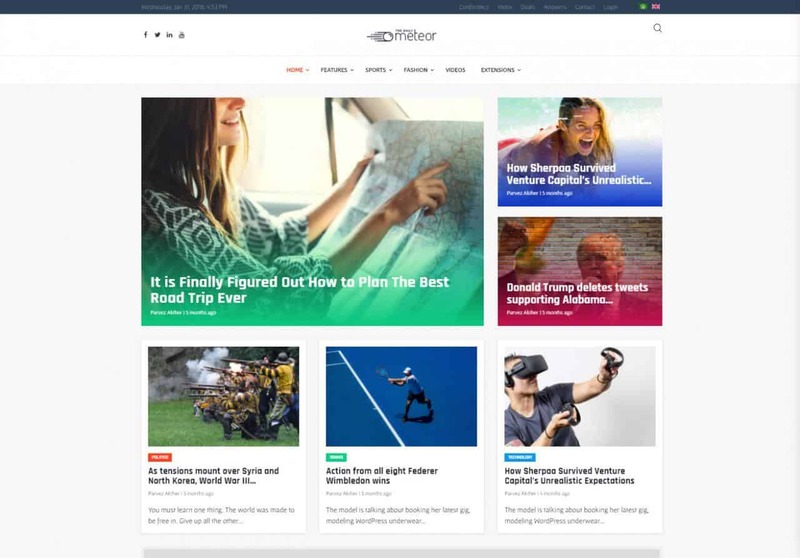 Meteor is a fascinating News & Magazine Joomla Template. Every feature covers all the necessity of a news & magazine site. If your question is, why should I choose Meteor? The answer will be: because it comes with amazing features, lucrative designs, blazing fast speed and reliable support. It has 5 stunning layouts: Classic, fashion, mosaic, sports, and tech. Each of these layouts is built with beautiful, unique designs, to fulfill the necessity of the user. Meteor offers you 11 attractive header styles, which allows you to set you the perfect one that suits best with your site. Posts are managed with an element called Meteor Article, so you can easily create and manage your articles anytime you want. Meteor article allows you to organize your posts with several designs so that user does not get bored watching same type of posts. Meteor offers you date element, news ticker, social icons and weather element, specially crafted for this template. This element helps you to give the perfect news site look to your website. This template is built with most powerful page builder Quix. There are 50+ elements available on Quix, which helps you to create and customize your news site. It does not take much time to build a section as you can do everything by drag and drop. Meteor includes AMP and cross-browser compatibility. This feature ensures your website is loaded very fast on every browser. Your viewer gets the smoothest experience that he desires. Amazing, isn’t it? Try Meteor now! If you are looking for a creative Joomla one page template, then look no more JD BizOne is the right template for you. You will be able to create your business site almost instantly with this template. Everyone needs to complete work faster, for this reason JD BizOne comes with drag & drop Quix page builder. From simple to complex, any layout can be easily build with Quix. If you can think it, you can design it with Quix. And all of this can be done without any prior knowledge of coding, just by drag and drop. JD BizOne comes with powerful Helix 3 Framework. Helix 3 gives you ultimate control from the template backend. From inside of the framework you can control presets, different styling options, layouts, menu customization, Typography and different settings for template. Blog is very much important for a site, this template provides you an attractive blog section. You also get pricing table and lots of other customizations too. 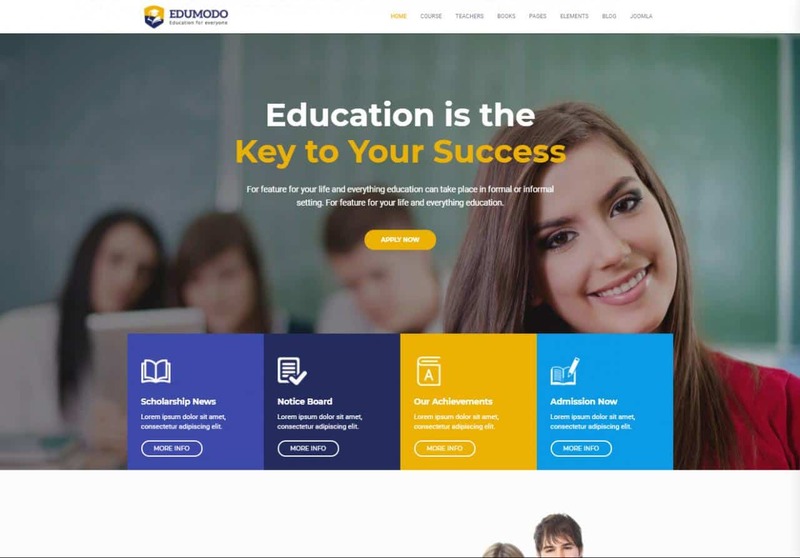 If you are planning to make educational website, do it with Edumodo template. It is an entirely optimized, fast loading template and best in its category. You can use it to build all kind of school, college or educational websites. We all know a meaningfully organized blog can make a first impression on your user’s mind. The design of the template is well furnished with modern bloggers and writers in mind. Every single post consists of authors name, category and posting date underneath each post. Edumodo offers you multiple home variations with different color combinations and typography. With Quix page builder, it will take only one click to choose your preferred home layout style. Besides you get 7 different styles of headers, you pick the one that suits best with your perspective. No coding knowledge and expert developer is needed to build website with this template. You will be able to build your website just by yourself using Edumodo as it comes with revolutionary Quix page builder. By choosing this template you save 300$, which would spend on development fee. The Shika LMS plugin makes Edumodo a full functional learning center. From classes to quizzes, assignments and all other curricular activities can be easily conducted with Shika. No more tensions with student management from now leave everything to Edumodo. Every layout of this template is responsive and suits perfectly in any device. Edumodo offers advanced typography with RTL support and lots of other exciting features. So what do you say? Try Edumodo today! Looking for a modern clean Joomla template, which will help you to manage events on your site? Well, look no more! Eventia is here to provide you everything neeeded to make your desired event management site. It helps you to create and manage any types of live events on your site. This template is crafted with clean codes and robust T3 framework, which helps you to create rich functional event management site. The event management component XpertEvent lets you handle every information regarding the event from one place. Create agendas, add & manage speakers, bio and social profile links beautifully with Eventia. This template is fully integrated with Quix page builder to help you create page layouts easily. You don’t have to be an expert to use Quix, just drag and drop everything. Build your professional website quickly and save your money which would be spent for development process. Eventia offers 6 pixel perfect home variations. Each home variation lets you create unique website with stunning color combinations. It also offers a list of multiple header variations, choose any header type from the list. Typography is an unavoidable term, that's why typography is a main focus of eventia. You will find more than 1000+ google fonts with this template. Select and use the typography suits best with your website. You will get an outstanding user experience with Eventia, as it comes with optimized performance. 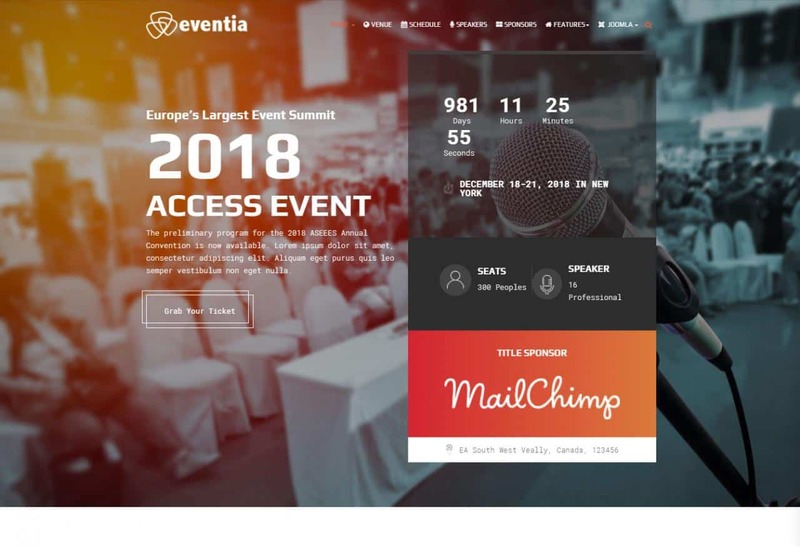 You will find event management component, countdown timer, speakers list, agenda timeline, and beautiful image galleries with beautiful sidebars. Eventia loads on every browser in very device, as it offers 100% mobile responsiveness with cross browser compatibility. ShopX is a J2Store powered eCommerce ready template that you can use for creating your boutiques, fashion, electric shop and online store for your business. It is a very flexible template and includes all the options that make website development very easy. This template has fully mobile responsive layout design to make sure you visitor gets the experience, he deserves. Shopx is created after a massive analysis of a certain time period. It is smartly created for eCommerce website and helps you to focus on every content. You can also use this template for making other types of websites aside from making online store, as the template offers different layouts with full-width sliders and beautiful layouts. Shopx includes Quix page builder which allows you to build advanced layouts for your posts, pages, and homepages just by drag and drop. Everything is possible with Quix; you have to just design. By using Shopx and Quix, you will be able to create your whole eCommerce site just by yourself. It comes with advanced smart checkout & dashboard. Consumers will be able to purchase product from your site with ease. The meaningful design helps consumer to shop and not lets to be confused even for a tiny thing. Shopx has advanced template option with more customizability. It makes sure to give you the exact site of the look, you are looking for. There is more stuff comes with Shopx, to find out explore shopx now. All these templates are not chosen randomly. You can choose any templates that suits best for your site. If you have any queries, comment below. Finding a right Joomla extension for your site is always painful when you have choice of 7K+ extensions. Right now, Joomla Extension Directory (JED) contains 7943 extensions and choosing right extension for sites could be a nightmare. For you we have prepared a short list of extensions which every Joomla site requires. All joomla extensions mentioned in this article are regularly used by ourselves and our child sites. Neither we have any affiliation with the extension provider nor we have used any affiliate link. [Update] You can build your Joomla website visually with our page builder Quix and you don't need any 3rd party extension for a slider. See our article How to create a beautiful slider with Quix and start building your website. When visitors visit to a website, they look for something: they want to take action or get information at a glance. They are always in a hurry to scan a site. A statistics shows, visitors take maximum 8 seconds to take decisions whether stay a long or bounce. An image expresses a thousand words and that's the reason slideshow came up. Conveying motto of your website to the visitors, and allowing them the answer, why they will hang on for a long while, is pretty challenging in a few seconds. Don’t worry statistics shows a solution. 90% of information transmitted to the brain is visual, and visuals are processed 60,000X faster in the brain than text (Sources: 3M Corporation and Zabisco). In Joomla you it’s pretty easy to create a slideshow. you'll find so many Joomla Slideshow extensions in Joomla extension directory. For your convenience, we've created a short list of free and premium slideshow extensions. One Page WordPress themes become a trend for product launches and startup business in last few years. As time passed, they have gained popularity for their user-friendly interface, first loading, easier navigation and unique layout functionalities. If you don't need a large or complicated website, one-page templates are perfect for concisely showing the relevant information that a site visitor may want to see. Here, we draw together some of the best free one page WordPress themes which are suitable for business, agency, portfolio, startup products or services. 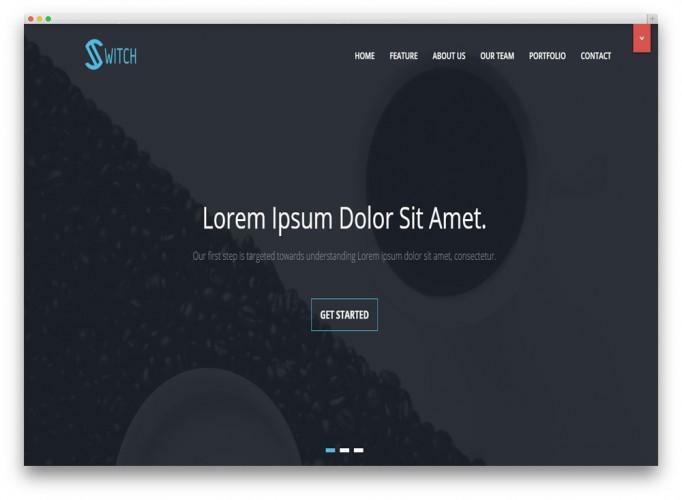 The Switch is a fast, lightweight, and free one-page business WordPress theme, developed with modern technologies. Every component of the switch is well organized and deliberately placed that anyone can highlight their business or corporate niches quickly. The coding structure has followed Google guidelines for the best practice of SEO. It also includes testimonial slider as you can add your customer's opinion that will work like the online review. 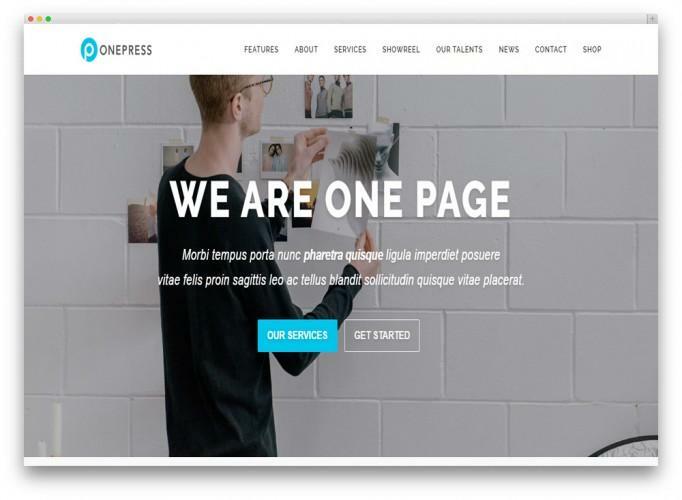 Onepress is a creative, flexible and responsive free one-page WordPress theme suitable for creative agencies, business, portfolio, product showcase and freelancers websites. It includes pre-made page templates that giving you access to functionalize your pages. The Quick is a multipurpose free one-page WordPress theme, the first multipurpose WordPress theme that has released on the influential OnePager. Quick comes with a built-in drag and drop builder which allows you to customize the entire website without any coding knowledge and without touching a single line of code. It packed with unlimited layout variations with an aim to meet the mysterious conversion. The responsiveness of this theme helps to view the site through all devices available in the market. 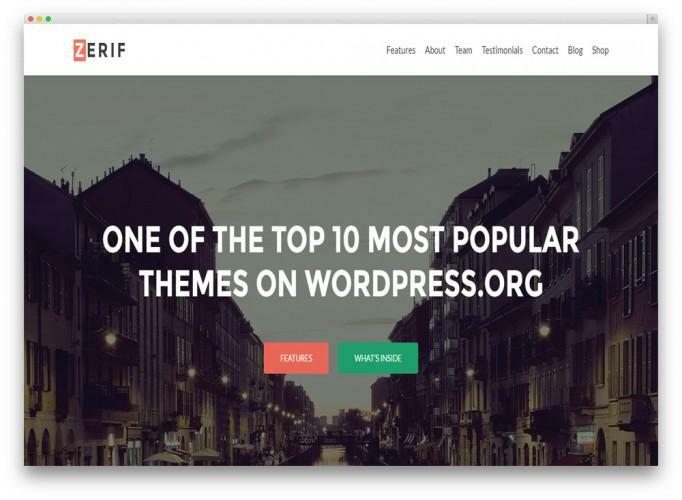 Zerif Lite is a responsive, stunning and free one-page WordPress theme that can blow your mind away. It is one of the most loved ones on wordpress.org and suitable for creative agencies. 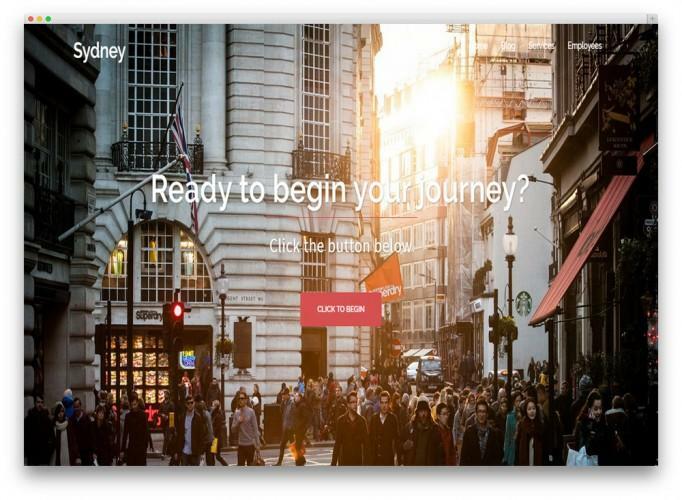 Sydney takes such a short time to get your site to look professional. The theme options will help you to change the functionalities and bringing together a beautiful branding environment. Agencia is a free business one-page WordPress theme released on the latest OnePager, comes with 12 preset style variations. It is exquisitely crafted with an aesthetic elegance to meet the growing need of this new era. 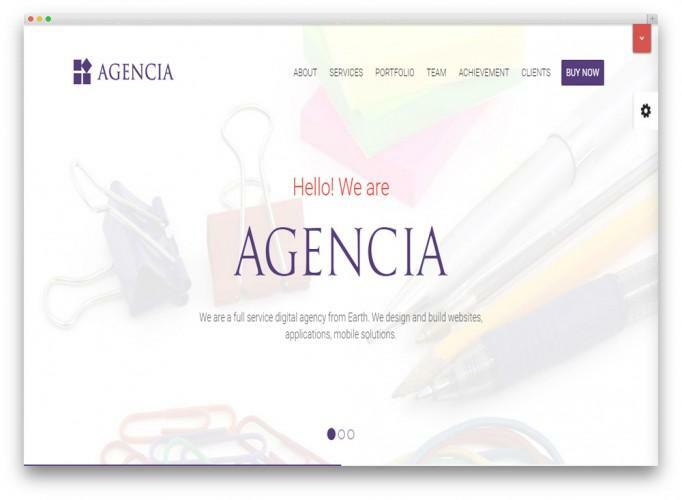 Agencia is fully customizable, robust, engaging and mobile friendly one-page WordPress theme. One click installer helps you to arrange the blocks and widgets as well as style. If you are going to start a medium or small size business website, Starter is the right choice for you to switch your project. It is a free one page WordPress theme designed adapting modern trend. The Himalayas offers everything that you need for a one-page theme. It can use for business, portfolio, corporate, photography or other types of websites. Agency is a free one page WordPress theme developed by Start Bootstrap, ready for you with all functionalities. It has some excellent sections such as team members, project showcase, about and client. 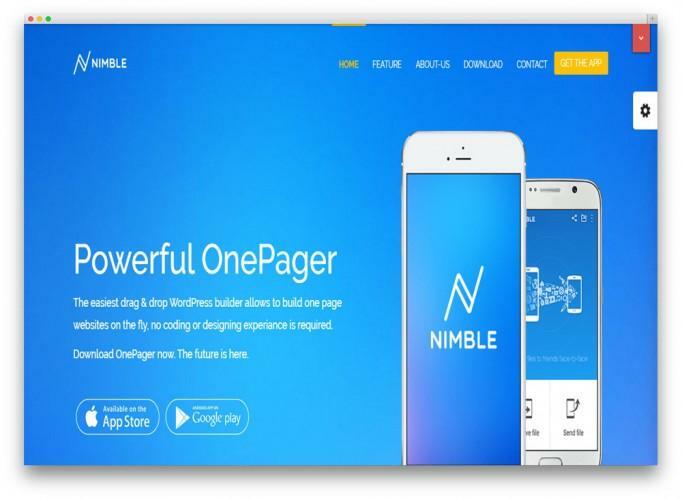 Nimble is a free app landing one-page WordPress theme, ideal for showcasing app details in a vibrant and fashionable way. It is specially designed for industry professional and engaging features to ensure the smart presence of site content. Nimble binds both pre and post launch themes to ensure the smooth communication with interested users. 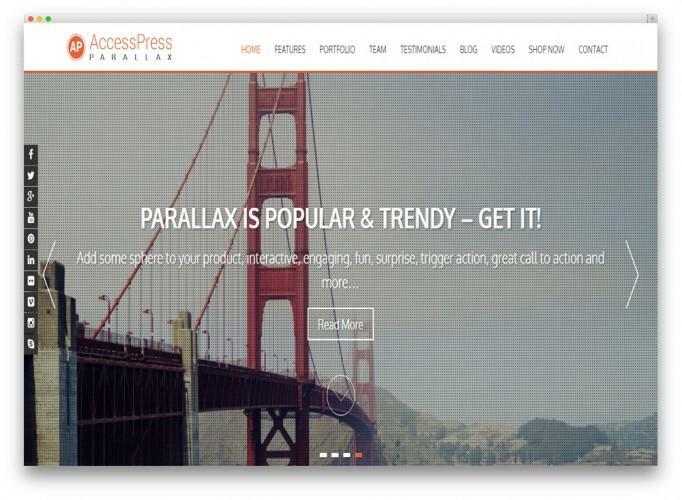 AccessPress Parallax is a beautiful and interactive WordPress theme with impressive parallax effects incorporated. It is an engaging and interactive free one-page WordPress theme for creating a perfect business website for your next project. 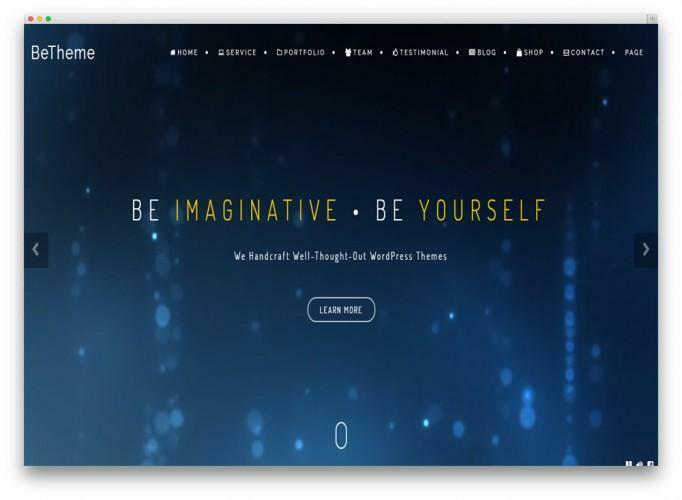 BeOnePage is a simple, clean, professional looking one-page WordPress themes. If you are an artist, a magician, a freelancer, or a person who just wants to showcase your services then give a try to this theme. 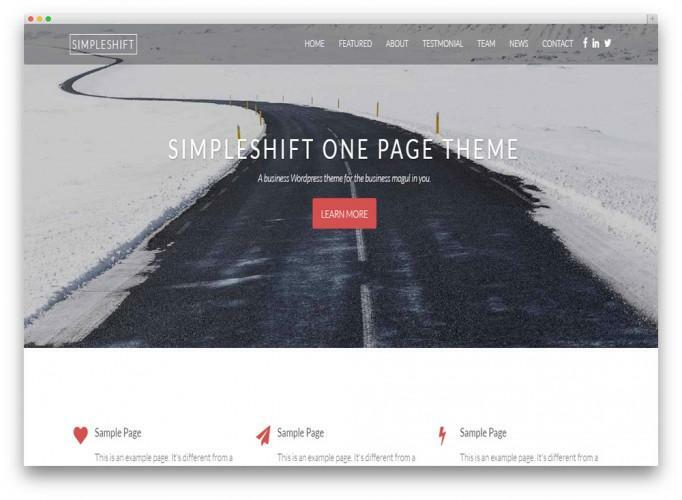 Simpleshift mainly designed with UX in mind, a clean and modest one-page WordPress theme. It is a free, responsive, easy to use backend options and amazing frontend work. The Notes is a free one-page coming soon WordPress theme including a professional countdown timer to engage visitors till you want. It built with cutting edge technologies to meet the growing needs of users and adding visual depth milestone without compromising its functionality. It also packed with unlimited layout variations that offer a broad range of advantages. 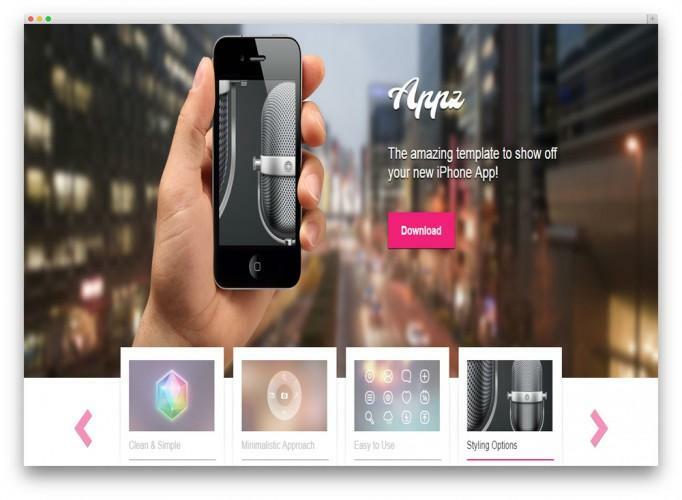 Appz is a free app landing one-page WordPress theme, ideal for showcasing app details in a fashionable way. It has the latest design trends and well-made usability. Anyone can quickly set up the theme and completely configure it. 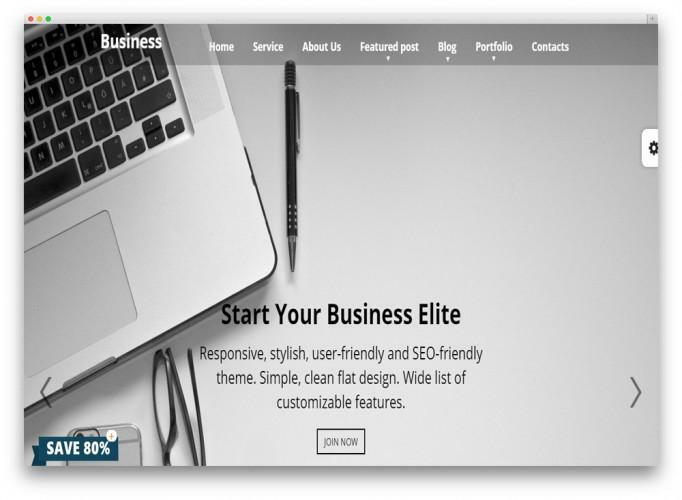 The Business Elite is an elegant single page WordPress theme specially designed for any type business. Its beautiful design and user-friendly interface help to customize the theme entirely in an amazing way. 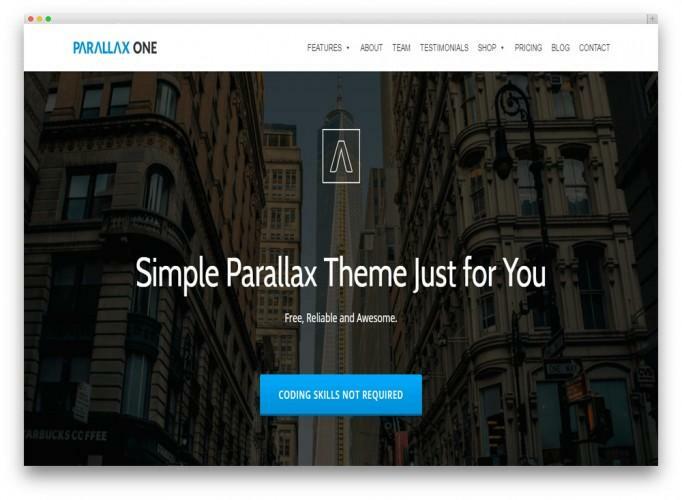 Parallax One is an excellent free one page WordPress theme with premium-like features. It offers you a stunning homepage with great theme options panel. 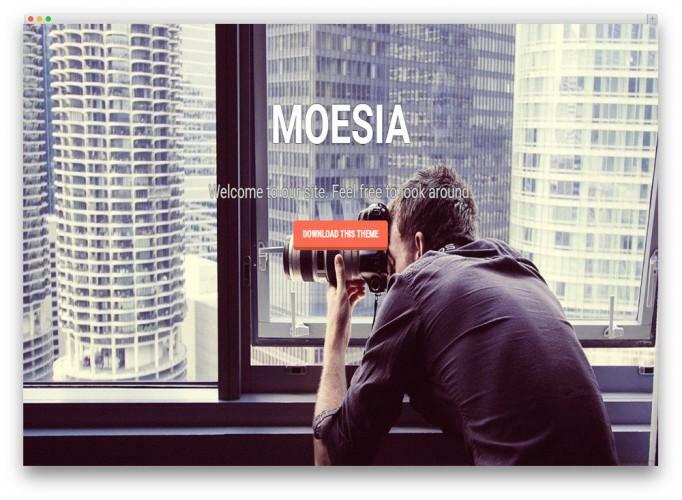 The Moesia is one of the latest responsive and SEO-friendly WordPress themes. It is one of the most familiar themes of its kind with over a thousand downloads daily. 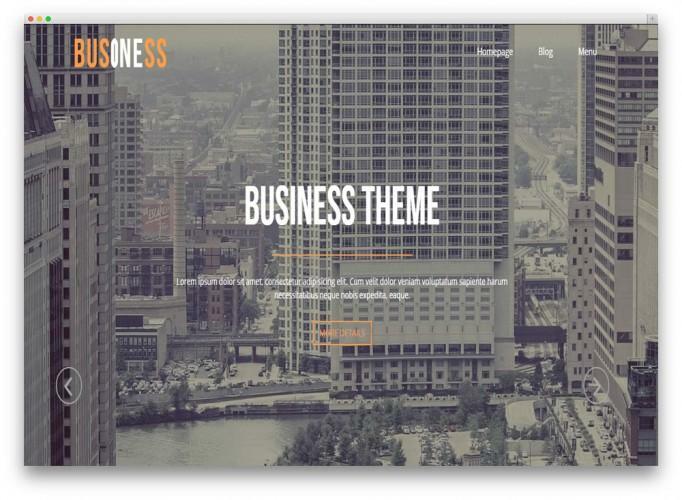 Business One is a surprisingly free portfolio theme built in HTML5 and CSS3 with great features. This theme built on Bootstrap Framework that is why you get a clean, responsive theme for your business. 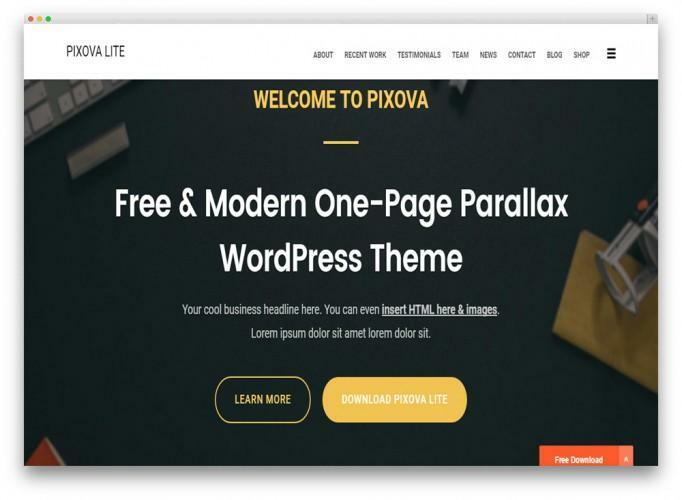 If you love flat web design, then Pixova Lite might just be the perfect match for you. Pixova Lite is an excellent example of flat web design done right; the metro colors work well to complement each other. 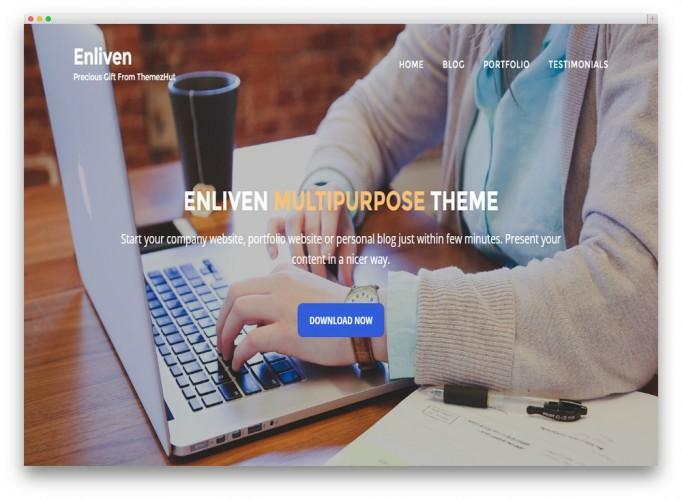 Enliven is a well-coded, another familiar theme. The most stunning thing about this theme is beautiful designed, simplicity, and easy navigation. Perth is a free one-page WordPress theme suitable for both companies and freelancers. 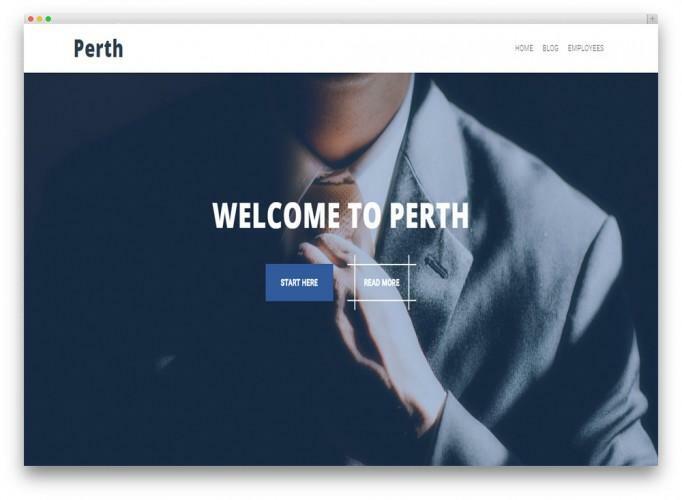 With Perth, you can easily create a strong online presence by taking advantage of the many construction blocks available in it. 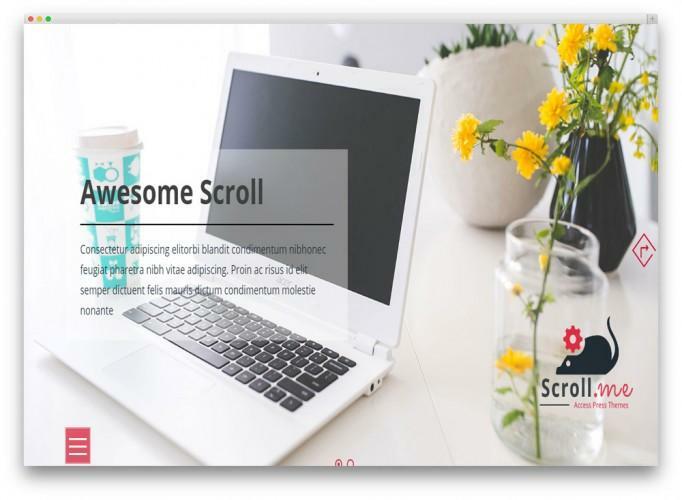 Scroll Me is just another excellent example of the sort of high-quality free one-page WordPress themes. It is a beautiful horizontally scrolling WordPress theme with an elegant design perfect for the personal blog, portfolio, photography, business or any other use. 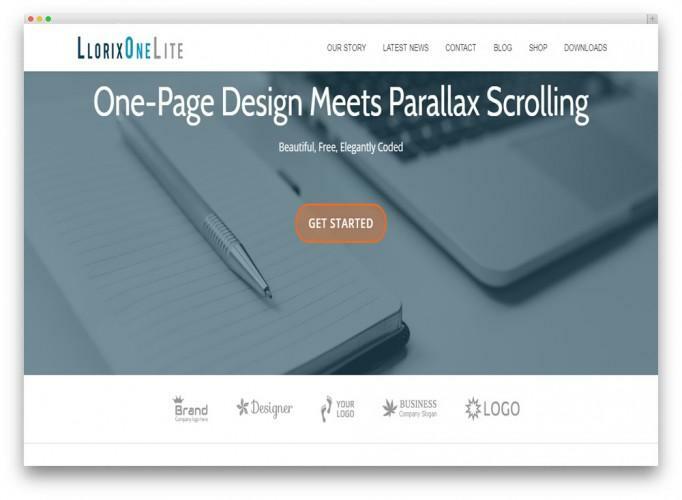 Llorix one is a visually fresh-faced, incredibly vibrant, robust and reliable, highly interactive, and technologically proficient one-page WordPress theme. 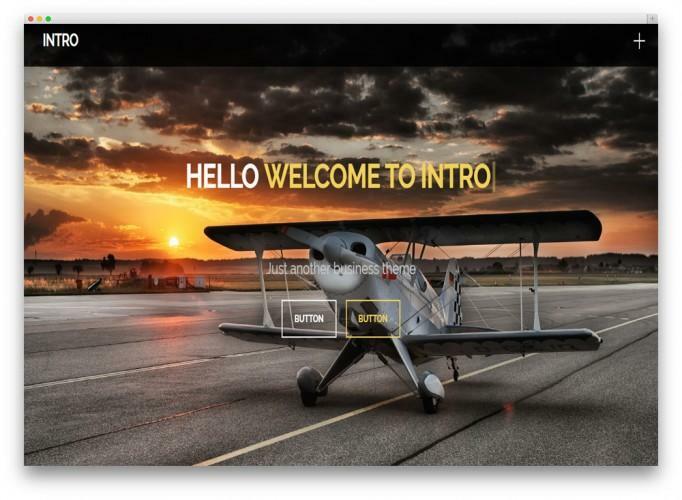 Intro is a modern, professional looking one-page business theme suitable for companies or individuals who wants to establish a strong online presence. Intro corporates a pixel perfect, completely attractive, visually refined design and of course natively responsive out of the box. Whatever the niche you are working with, ultimately your goal is to reach out to the wider range of users. To do this, you need to be up-to-date and modern with the trending design and technology. Hope these professional themes will be helpful for you to choose a suitable one for your business. If you would like you can checkout top Joomla onepage templates. Let us know your opinion about these through the comment box in below. 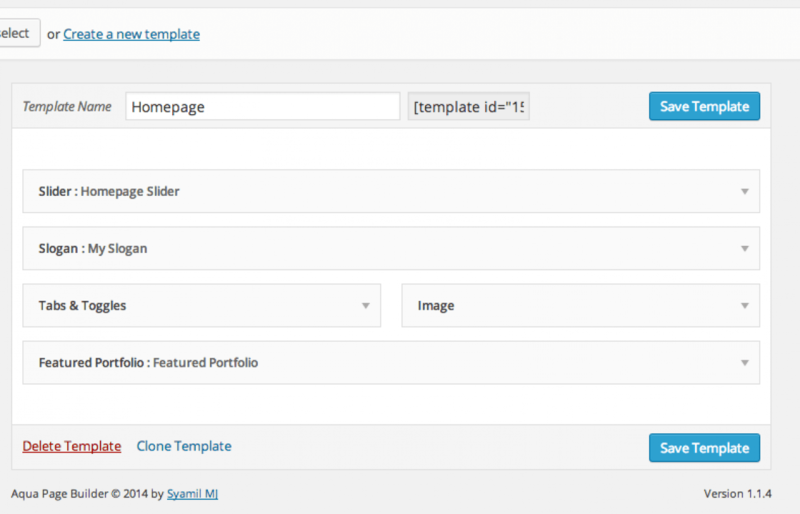 Joomla page builder is a great tool. Website development got more easier with page builders. In Joomla, it is a kind of extension that is found on Joomla extension directory. It helps you build your site very much faster and save your valuable time along with money. Before page builders, you had to build a website by doing custom coding or hire a developer and invest lots of money. Now in this modern era, you do not need to repeat old ways. Instead, you can build your website by yourself using page builders. But when you take a look at the market there are lots of page builders and it often confuses us. When building a website we have to invest our money both carefully. Some of us cannot invest their money and time twice, therefore choosing a good page builder is very much important. If you are a Joomla lover, then it is impossible that you haven't heard of Quix best Joomla page builder. 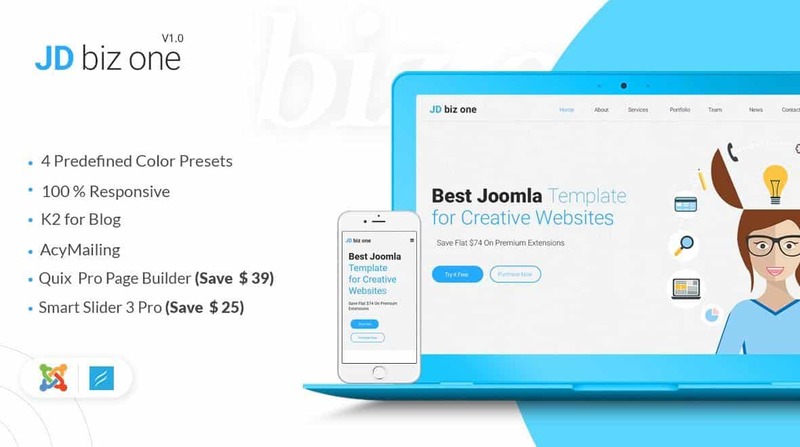 This advanced Joomla page builder comes with drag and drop interface that allows you to build any layout very fast without any coding experience. It is a perfect Joomla visual editor that can be used for building any kind of websites. Quix page builder is built by ThemeXpert team to enhance your page building experience. It is not a new product; it has been built with a year of research and experience of real-time users of Joomla. Time & money is very important in everyone's life; therefore ThemeXpert team has to build Quix page builder so that both your precious time and money can be saved. You build professional websites by yourself instead of giving money to others. This Joomla 3 page builder, comes with compatibility for any templates and frameworks. The most popular frameworks like t3, helix, gantry, warp supports Quix. No matter which template or framework you like to use, Quix will always work perfectly. This best Joomla page builder comes with both free and pro version. You can do almost everything with this Joomla page builder free version. If you compare the free version of Quix with others builders pro version, you will see the differences and power of Quix Joomla page builder free version by yourself. This page builders free version can beat other page builders pro version. Then think what its pro version can do? Quix Joomla page builder comes with two types of the builder- frontend builder and back-end builder. Backend builder is named as the classic builder, and it allows you to build in fully classical way. The magic comes with the frontend builder which is names as the visual builder. Visual builder allows you to create a Joomla website and any Joomla layouts within minutes. The drag & drop layout building allows you to optimize your joomla web development time and develop without knowing any programming language. Even you can instantly see the preview of every change you made on an element; you do not need to click any preview button. On the live frontend UI, you can instantly drag an element and move it to your preferred place. You got everything in one place that is needed to build a professional website with Quix - best Joomla page builder. The most powerful feature of Quix is building complex layouts. No matter what type of layout you want to build, it is always possible with Quix. It is possible that you might get tangled or lost when you try to build any nested columns. But with Quix, it is very easy to create nested columns. Generally a page builder offers you only the page building options, Quix offers you more than that. You can optimize the SEO of your entire site with the guided SEO tool of Quix called QuixRank. You don’t need to be a SEO expert or spend any additional money on any Joomla seo extension. There are more than 30+ assessment rules for checking that your page is properly optimized for search engine ranking. This assessment tests are done automatically and then generates report along with solution. From text length to focus keyword everything is checked so that your site ranks faster. Insert any number of images on your site, then optimize within one click. Quix Optimize lets you optimize all your images from builder page with single click. 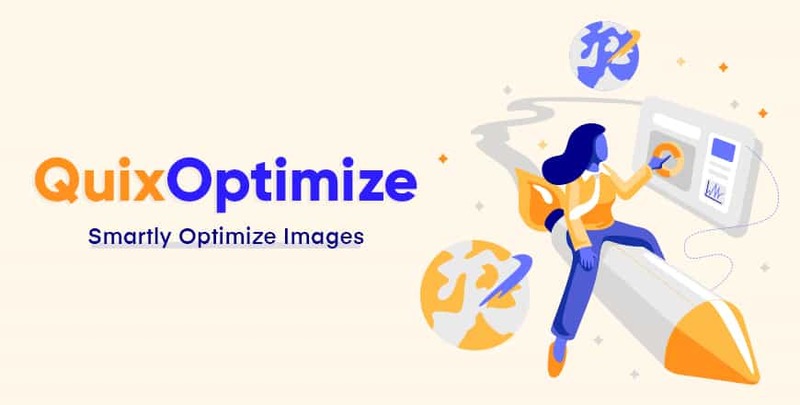 There is no need to use any additional Joomla image optimizer tool to optimize your images. Just set the image quality and then optimize. If you think the balance between quality and size is not optimal, then you can re optimize the images. Control what your users see or do on your website. If you want to show specific section for specific users, do it easily with Quix ACL. For example, you want to give special offers to new users only, how do you do it? Create a new page and then make it hidden for old users? No, that’s very old idea. With Quix create whole page then apply acl to your preferred section. Your old users won’t see it, unless you want to. Every site requires a form and to built it you do not need to rely on any other Joomla contact form extensions. Quix offers you form builder element, that helps you to build your required form instantly. This element is enriched with all the necessary fields that is required in a daily contact form. Add as much as fields you require than collect the data, it can be a survey form, login form, registration form etc. 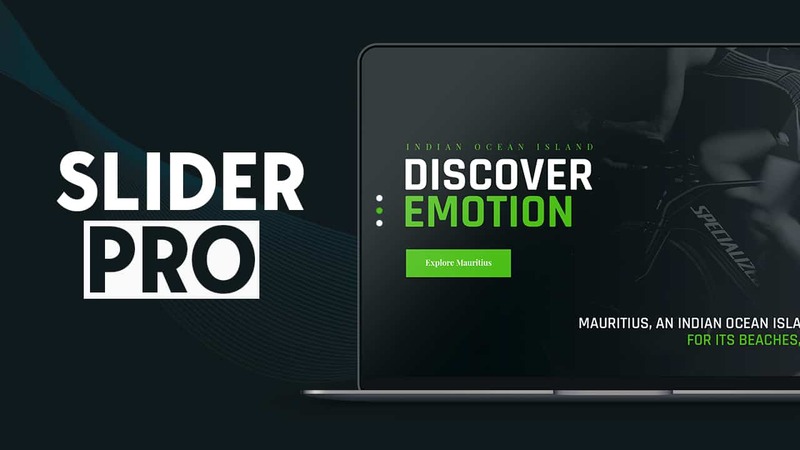 A great looking site always catches the eyesight of the user by showing elegant slider and images. If you can create attractive slider, the chances for staying at your site of users increases a lot. To create a stunning slider you might think of using third party extensions, but not anymore. Quix’s slider pro element allows you to create mind blowing sliders within shortest time and very easily. Add different animations, navigations in the way you want with slider pro element. Slider don’t meant to be designed in one way, it's your site, style it in the way you want with Quix page builder. Our eyes don’t like to watch common things and we are very much used to watch same type of site over web. You can make it unique by using shape dividers. There are more than 22 shapes available in Quix. 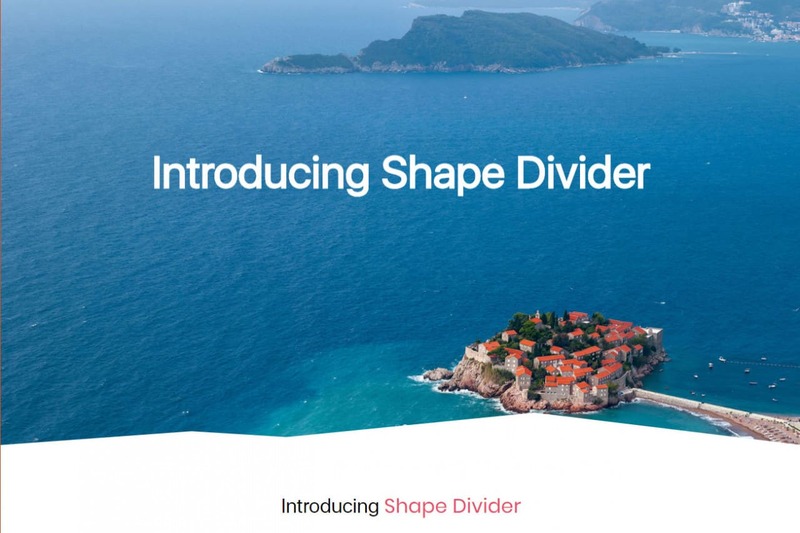 This shapes are entirely editable, adjust the shape according to your size and divide section in a unique way. You can add shapes to bottom or top of your section. For each position you can select your own pattern of shape, height, weight, and color. Extensions make your workflow better and you can extend the functionality of your tool with 3rd party integrations. The developers of Quix tries to implement all the necessary features that are needed in the builder. But implementing everything is impossible, therefore Quix comes with 3rd party extension integrations. The most popular extensions that you need in your everyday life is integrated with Quix. If you need any additional extension, than just integrate and use it with Quix. Getting tangled with media files is one of the common problems in page builders. To solve this problem, Quix has come up with the advanced media manager. Media manager organizes all your media files in one place. You can easily upload download all your media files at media manager. If you lost a file search it with name. By default there is more than 1000+ SVG icons are available for you in the media manager. Insert any icon whenever, wherever needed. One of the biggest and most necessary 3rd party integrations of Quix is Unsplash. There is no need to browse outside the builder to get an image. Within media manager search for any images and insert directly without any hassle. Your valuable time will be saved. Quix - Joomla visual composer has lots of mindblowing features which is built to ease your workload. This Joomla page builder comes with Super flexible layout system, in which you can modify column numbers (add or delete) any time you want, duplicate columns, resize columns, make nested columns very easily without any complex procedure. 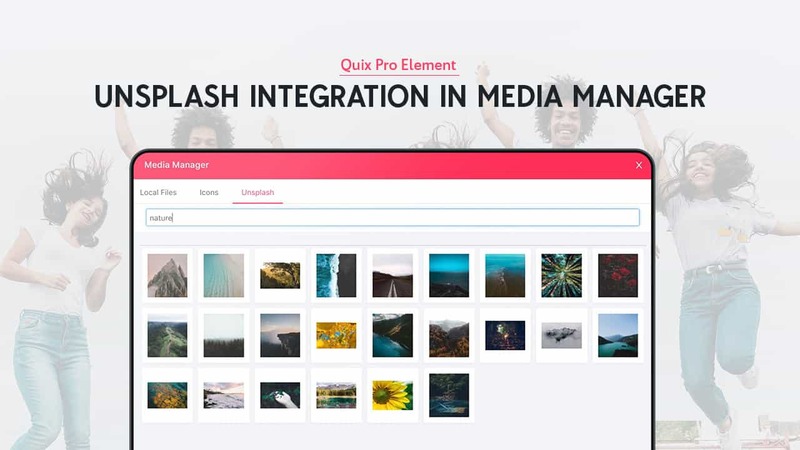 The media manager of Quix provides you the ultimate media solution. You can use any images, animations, videos and SVG files with the media manager. And if you need any icons, it also provides more than 1000+ SVG icons. SP Page Builder is one of the very powerful and feature-rich Joomla page builder. You can create 100% mobile responsive website in the quickest time with this extension. Everything you do, every change you made can be seen visually and done instantly. SP page builder comes with both front-end and back-end page editor. Use the one you are used to, or you would like to. SP Page builder is packed with powerful Helix framework. Helix is the fastest template framework which is built with clean codes and modern technologies. Helix is fully Search engine optimized; as a result, you can rank up your content on top of the search result easily. Everything you do with Helix is both user and developer friendly; you will not find any type of complexity while using the framework. To make a desired website, you need to use add-ons. These add-ons help you create your preferred section without any sort of coding. There is a total of 50+ add-ons available with this page builder. Each addon has its own uniqueness and purpose. You get 14 free add-ons with the lite version of SP page builder. Where others do not provide anything for free, but SP page builder gives you these free add-ons to design and build your site in your way. Though there are many limitations with the lite version yet, you can at least build a basic website with the help of this lite version. If you want to take the ultimate experience of using SP Page builder than you must use the Pro version. But it is a matter of doubt whether you will be satisfied or not. In this modern age, website building is not tough task, to make it more easier SP page builder offers you award-winning drag and drop system. Every element is kept on the sidebar, you just drag & drop the element you need to build your required section. It doesn’t matter what you build with the SP page builder, it will always be 100% responsive and any device ready. With drag and drop page building, every change you make, takes action in real time. Therefore you do not go for any preview. No need to be a pundit on Coding. No frontend editor with free version. Moderate options for complex layouts. Responsive column resizing is not that good. On the fly column cannot be added not even resized, it's totally limited. Page specific settings not available. Pre designed page templates is kept free, but without purchasing pro version you do not get the “Pre designed page templates” which is told as free. JSN Page builder is one of the top Joomla page builders from JoomlaShine. This powerful page builder lets you create any complex web content very easily within the shortest time. You will get what you want with JSN page builder. This page builder comes with lots of features and functionalities along with three pricing plans: Free, Pro-Individual, and Pro Developer. Each plan vary very slightly, let's see it’s features and functionalities. JSN page builder comes with outstanding elements, with the help of these elements any simple to complex layout can be built. That's not all; each element has several predefined styles. So, you do not need to waste time on each element. If you like one element drag it, place it and modify the basics only. To make short, your working, JSN page builder also comes with premade layouts. These layouts minify your working load, and you do not need to think about the design either as its been already done by the professionals. This Joomla, 3 page builder, is very easy to use, and all the settings are well organized in one place. You do not need to go to several places to conduct one change. Every general, styling and advanced options are placed in three different tabs of settings panel. From this panel, you can alter the element and give shape the way you like. First, it may look a little bit complex, but as soon as you start developing it will become easier. Visual Editing with Joomla Integrated JSN Joomla editor helps you to edit modules, articles and more very easily with the help of amazing drag and drop manipulation. Visual editing doesn’t require any kind of previous coding experience. Drag the element you needed, and with a little modification, you are all ready to go. This Joomla content builder is compatible with all popular template frameworks. If you have your preferred framework, do not worry use JSN Joomla page builder conveniently with the framework. The performance will be the way you expected. UI is not so elegant. Free version is very limited, only 3 Pages. Azura Joomla page builder is an advanced back-end builder for Joomla. 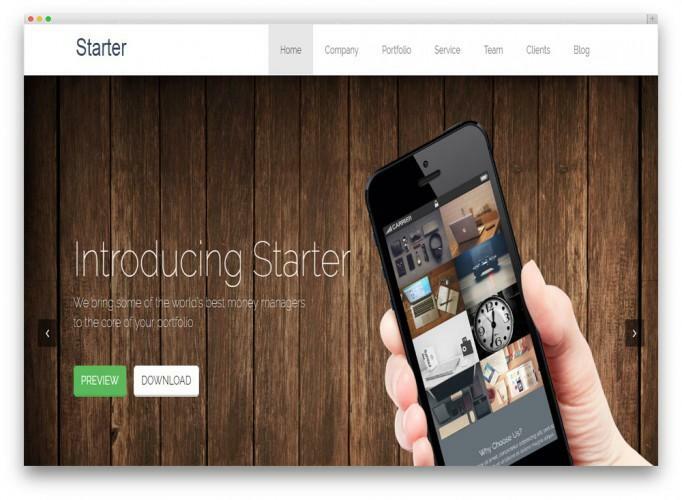 The drag & drop UI of this Joomla builder allows you to build your website in a few minutes. Every section you build requires only drag & drop and modification. No additional coding knowledge is needed unless you want to do custom coding. Your satisfaction is guaranteed with Azura page builder, if you do not like it, you can ask for a full refund within the first 7 days of signing up. This page builder offers four different pricing plans- Free, Personal, Business, and Developer. The free version only provides you the basics with limited supports, 20 built-in elements but with unlimited website licenses. The personal plan comes with a single license, $25 per year and 10% discount on renewal. The other two pricing plan will charge you $40 and $100 per year. More than 40 advanced elements is packed with Azura page builder. Literally, any kind of section can be built with these elements under minutes, and you do not need to touch even a single line of code. This page builder comes with template compatibility; therefore you can use this Joomla builder with any templates. Azura page builder is provided to you by cththemes, and they accept request for new elements. If you ever need any elements just post a request to its developers. Everything in Azura page builder is based on drag & drop with back-end page building. To build a section, you choose the specific element, then drop it on the section and alter its setting according to your need. Every element of Azura, has multiple customization options- General, Style, Typography, and Animation. You will enable you to bring out the aesthetic senses trapped inside you. Joomla content component support comes by default with Azura; you do not need any custom plugin to create video, gallery, slider and article post. With the Azura page builder, you have the power on your hand. Along with Joomla content component support it also gives you Joomla custom module support. Previewing changes will cost your precious time. Only basic elements are free. A live website builder that lets the user configure website in real time and everything on the site, updates instantly. Joomla Website Builder Gridbox is a modern all in one solution for everyone, who crazes to build elegant Joomla blog or a website. Build any section by dragging elements, and you can see the changes without any delay. If you like to lay down and have no time at all, you can try readymade page blocks. Making a website is now a task of minutes. With gridbox, you can take control fully with a few clicks. Alter the typography of any text you want and give your user the reading sensation he looks on your site. Customize fonts, size, height, width, margin, padding and anything with girdbox that makes your content typography rich. All elements that come with Gridbox is fully draggable. You can place any element anywhere you want. With this simple tool, change the way you used to build a website. After placing an element click on settings and customize it to build your dream website. By chance, if you misplace an element, you can replace it also by dragging, or you can also clone it with a simple click of a mouse. In this way, your precious time will be saved. Joomla Gridbox gives all power to you. With its intuitive admin panel manage your website lot faster. Manage all accesses from one page, make any page private or public as you wish. You like then you can also export pages. If you are in a hurry and need a readymade website right now, you can try pre-built websites. You won’t have to touch a single line of code or drag any element from the elements panel. Everything is already built, you just make a few tweaks, and your site is ready to roll. With the help of these themes, you can build any type of sites, but if you wish to build your heart content than you should start from very first. Joomla website builder gridbox comes with the flexible, responsive editor and Gridbox blogging app. With the help of this blogging platform make fully responsive blogging sites very quickly. The wide range of tools makes your blogging world easy. Style your blogs with different layouts, choose the full width, boxed, right sidebar, left sidebar or any other layouts styles. Do as your heart wants, with Joomla website builder Gridbox. All the blogs you make will be entirely mobile device friendly. No matter which device you use your blogs will look same as it looks on other devices. JA builder is one of the best builder tools for Joomla CMS, crafted by Joomlart. Create a stunning website instantly with elegant premade page libraries and content blocks. There are so many choices available, which doesn’t require many customizations. Every element blocks come with preview, so you do not need to place and check one by one. Preview it and if you like it, then use it on your website. Wait that’s it? Actually, more customization can be made. On each block, you can customize by every element. There are more than 18 types of content blocks are available with JA builder. Here you can find more than one choice for every , and a total of 130+ blocks are available with JA Joomla content builder. This page block contains homepage, about us, portfolio, contact, etc. Within just one click a block can be instantly inserted. Every content block is designed with professional designers and keeping users requirements on the mind. The most popular designs are already done. But if you like to customize more, edit each element like the way you want. These blocks are updated on a regular basis. Time is a very valuable asset, to save your time JA builder provides you 29+ premium page libraries. These pages are fully completed and ready to be used at anywhere you want. Top to bottom of every page is elegant and designed by keeping your needs in mind. From the page, menu select “Page” and insert the page you like. Just only with one click it will be inserted and look alike the preview. These page libraries won’t be same forever, Joomlart team updates this pages and also add a new one on a regular basis. JA Joomla page builder is packed 120+ content blocks and 29+ page libraries, which are fully device responsive. Every layout you built with this page builder is 100% device responsive. No matter which device is used to visit your website, it will always look the same as other devices. When you built a section, you can check the device responsive settings and view different device layouts like, widescreen, desktop, tablet, phone. From there you can change or disable any sections you want. Premium content block not available with free version. Premium Page library is not included with free version. User interface is not good. Take entire control over your website with Blox page builder. Build any simple to complex layouts that you can imagine with this advanced page builder. With its drag and drop layout it everything on your site will be done in no time. Its fast layouts save your time, you just select how many columns you need, and columns will be instantly added. On the fly, if you need to remove the one, you can do that too. Blox Joomla page builder understands your needs; therefore it allows you to create Joomla websites of any types including business, agency, education, e-commerce, one page, magazine, news, events, etc. No matter which site you built it will always be responsive and always show the same way on each device. We notice the big things but sometimes ignore the small ones, which also take a vital role in website building. With blox page builder you can also cover those small ones. Such a small option is column spacing. Column spacing lets you change the gaps at once so you can try different types of column layouts. You can also add or delete any column layouts on the fly. It’s not like you can add or delete columns at the beginning, add or remove any time as per your wish. Each row you add with blox builder can have a container to center the content inside. Blox builder allows you to add a background to your rows; you can add any solid or image backgrounds to your rows. Sometimes padding of each row is needed specifically, and this option is also provided by amazing Blox page builder. Blox Joomla visual editor is packed with every necessary add-on that are needed on everyday website building. These add-ons don’t holdbacks you; it lets you do more. By using these elements you can build a layout in many different ways. While building websites, you might often need to use icons, and therefore you seek help from the third party. Blox page builder solves this problem of yours; you do not need to any third party icons. There are hundreds of crystal clear icons available with this page builder. Possibilities increases in a new way with this Joomla, page builder. Each addon that come with blox is fully customizable, therefore with a single addon, you can create a lot of different layouts. If it's not enough for you, then you can write your custom HTML, CSS and JS code. 700 + add ons available, but access only a few addons is given with free version. User interface is very complex. Now in this point, there might have a confusion have been created regarding page builder. You might be thinking “which page builder should I choose?” Actually, this depends on your need and what functionality you want. However, if you would ask me, I would recommend you for Quix - Joomla page builder. Quix got more advanced features and functionality than other page builders. It lets you bring reality to your imagination. This page builders free version already better than other page builders pro version. You can do more amazing things with its pro version. A Page builder is a tool that helps you to design and build website faster without much effort. Even you do not need any kind of coding knowledge while you build your website with page builder. We all want to save money and time. A page builder allows you to save both together. You will be able to build magnificent website all by yourself with help of drag and drop page builder. Why you should pick Quix and not another pagebuilder? Quix gives you ultimate solution for any types of site building. It is unbeatable with elements, features, functionality and time. The developer team of Quix, the themexpert group is always there for you when you need help. You can read about one of the feedback from themexpert site, from this link. A page builder will lessen your workload and save your time. Therefore choose it wisely and be thrifty for your money. Have any questions on your mind? Drop a line in the comment section and do not forget to give your feedbacks. There are many benefits to translating your Joomla website, but it can seem like a daunting task at first. Joomla has translation capabilities built into the core but you need to go through the process of adding a new language, creating a content language, enabling the language filter plugin and creating language categories to get started. After that you are still stuck with a system that does not allow you to translate any 3rd party components and you have no overview of what content needs to be translated or what content has been updated. Neno is free and Open Source and is all you need to translate your web site manually, but it also offers the option of sending your content to be translated by professional translators for €0.10 a word. Neno also offers the option of using machine translation from Bing, Google or Yandex. Premium Membership is also available, priced at €99 per year. Premium membership entitles you to email support. The ability to translate any 3rd party component. The user interface is nice once you get your head around it. There is one place to configure tables called "Groups and elements" and another where you do the actual translation. The interface has many useful features we liked such as Mirror scrolling and visual formatting of HTML & JSON. Neno was fairly straightforward to install, you have to select what languages you want to translate into, and what content to translate. Installation took about 20 minutes which we found a bit slow, but we were told that it is because Neno creates copies of all your content for each language and that takes time as it is intensive database work that could slow down the server if not done in small increments. Thankfully there is a nice installation screen that shows the progress. After install is complete you can navigate to the Neno Dashboard. In Neno’s “Groups & Elements” view it is possible to choose what and how content gets translated. You can for example, automatically machine translate your blog comments, manually translate your Main content or order professional translation for your blog posts and entirely skip translating user comments. Because Neno allows you to translate all database content and language files straight out of the box, any 3rd party component can be translated, even if it is one we created ourselves. After getting Neno Translate setup the actual translation of the website was surprisingly quick. Content was already loaded and ready to go, all we really had to do was click on the “translate all” button, adjust the mistakes made by all machine translations, hit save and move on to the next piece of content. The interface is nice and intuitive to work with. Neno Translate was designed specifically for translating joomla websites and claims to offer the only translation solution with no performance loss. Neno achieves this by creating a duplicate database table per language for each table that contains translatable content. These duplicated tables can maintain the exact key and index optimisations as the original tables which ensures there is no performance degradation. When you are stepping for creating a new Joomla website, you have to consider a lot of factors before you kick in, like you have to choose an exquisitely crafted design, best hosting company to host your files and the most prioritized factors among the all choosing is to go for the right Joomla templates. This is most important decision that you cannot take lightly. There are a plenty of Joomla templates you will find in them market. All are not trustworthy, because internet is open for all. Anyone without having a least knowledge of security holes and Joomla best practices can develop a template and distribute them easily. Using those templates for your websites may cost you money and value time. 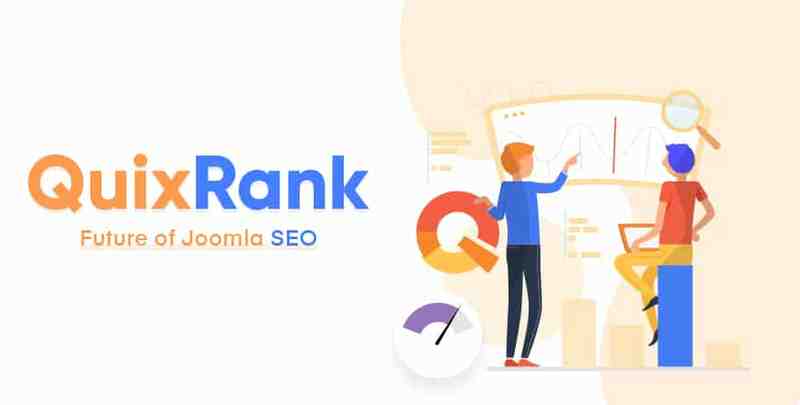 Now the question is how to pick the best Joomla templates that are secured, trustworthy and endorsed by thousands of Joomla developers and users. right? It’s super simple find best Joomla template firms running with huge clientbase. But don’t worry I am going to make everything easy for you. I’ve hand picked 15 best Joomla templates developed by industry leaders, which are boxed with tons of default core feature that save your developing time and give you an unified experience. Let’s dig in. Stuart is Multipurpose Joomla! Template blended with an elegant and subtle design, adapts perfectly with business, corporate, medical and portfolio based websites. But possibilities are endless with infinite customizability and configurability, allowing for an equilibrium between professionalism and artistic piece. Another stylish Joomla template intends to resolve the problem of growing legal industry, and competition, while giving the viewer a look of absolute assurance, and showcase your expertise at its max. Crafted with latest technology and utmost care to satisfy your expectation precisely. Nefario is a premium Joomla template designed to make your mediocre business looks to a platform of experts. Absolutely clean and refreshing Joomla template comes with tons of core integration to boost your business into a whole professional level. Callisto is crafted by RocketTheme and the first Joomla template released on their Gantry 5 Framework. The template is powerful and nicely color-coded, best suited for those who want to set out their online business on a platform allowing highly customization with tons of possibility. Unity Joomla template unites business with an artistic touch. It will mesmerize you with the availability of color contrast and pleasant layout. Ensuring 100% satisfaction from the first look. The template is one page best suited for business, portfolio, corporate and showcasing websites. Sixth Avenue one of the best magazine and blog Joomla template crafted with subtle elegance, aesthetic design approach with heap of love for details. This is the great piece released by YooTheme, tightly anticipated the latest Widgetkit 2.3. The Joomla template is highly customizable and twistable according to your need, packed with About, Features, Service and Blog pages to build your online castle with an hour. Spaghetti Restaurant Joomla template brings a delightful touch coupled with Delicious animation. The eCommerce template is ideal piece for responsive websites representing the heaters establishment on the front of food aristocracy. JA Charity is the one of the best charity Joomla templates ever comes with all features to run charitable organizations seamlessly. The template is crafted with simple and vibrant design best fitted for NGO and religious charitable organisations. The template is well-equipped with VirtueMart, JoomDonation, Acymailing Joomla newsletter component and a lot more features allowing you to do some extra more. BizCorp is another one page Joomla template specially crafted to compress eCommerce service to simple one page website. The template comes with four elegant presets and perfectly designed sections to provide ultimate control to drive business motto perfectly. Hostx is a beautiful Joomla template elegantly crafted in approach of material design with cool animations, providing a contemporary and corporate approach of hosting Joomla template construction. Presets allows quick diversity of overall color extraction. Making a booking for a hotel room is really sometime challenging. Even It's found difficult to show customers what they get what they pay. Thanks to Villa Bellucci Joomla Hotel Template to make every opportunity accommodated with ease. The responsive hotel template comes with all possible component to allow the customers placing easy booking for the room they look for. Planning to launch a website for your next event? Meet EventX, The template is smartly crafted with stunning graphics, contrasts and tones, allows easy adding event schedule, speaker lineup and profiles, event gallery, and a eye-catching countdown to catch up the remaining time of the scheduled event. Appy is that fluffy awesome looking Joomla template which everyone wants to own because of its Dynamic and Colorful Layout. It comes with a couple of opportunity so that lead you to get your own business started with a day. The responsive Joomla template is boxed with numerous pages and latest technologies to allow you to drive your business to the desired destination. Fitness Center is great Joomla template crafted by Shape5, perfect for gym or personal fitness training websites. The fitness Joomla template comes with eye-grabbing design packed with all great features to get you and driving your business with handsome pace. An highly engaging Joomla template for those who want kickstart news and magazine website right away. The Joomla template is highly responsive, easy-to-navigate and well compressed platform to boost your news site with maximum amount of information on the front page. Designed to transform into simplicity. These themes are the roughly chosen among the best Joomla templates by trusted template providers. If you think, we have missed to add some of the best template you are experienced with. Let us know, we add those on the list. We all want to save time and enhance our website developing experience. Besides we also want to complete our task in easiest way. In web development there is no other way to complete development easily except using Page builder. In WordPress, page builder is an optional plugin, which enables you to edit pages with enhanced drag and drop editor. With the help of it you can easily create your desired section without any coding knowledge and within shortest time. Where regular procedure would take 2x-4x longer time with more complexity. All the WordPress page builders available in the market are either free or premium. Free page builder offers all the functionalities required to easily develop your website. You can complete your website with free page builder but after a certain point you might feel the necessity of premium page builder. Premium page builder offers more functionality and features than a free page builder. Besides you get premium support with it, so if you ever stuck anywhere you can ask expert to sort it out. There is some unique features which allows you do more and explore your creativity. Without premium version you can't even think about it. Now you might be thinking which page builder to choose. Am I right? It doesn’t matter free or premium, if your desired page can be created with free version than why to choose premium? When you feel the need of premium version, only that time you should buy it. Well, we do not want to waste our time discovering products, so I am giving you a short list of some best page builders. OnePager is the first one ‪‎page website builder for ‪‎WordPress boxed with all the modern and powerful technology to take your site developing experience to the next level. Where you can quickly create and edit your website on the fly without having prior programming and designing experience, forget about the site designing on Photoshop and transforming them into fussy codes. Sounds fancy, right? OnePager is packed with tons of design blocks ready with numerous variations which can be fit with any section of modern websites, no business niches matters. The things really matters that is your ultimate taste of exquisite block selection and place them with coherent sequence. Don't believe in your latent excellence? Have a look on OnePager powered WordPress themes which are being continuously developed by one page lovers. If you are really care about the community appreciation to add this might drag and drop website builder plugin in the daily list of WordPress toolset, OnePager is produced featured on ProductHunt and continuously download in handsome pace from the WordPress plugins directory. If you are thinking to build website for your own, than Elementor is the best choice for you. 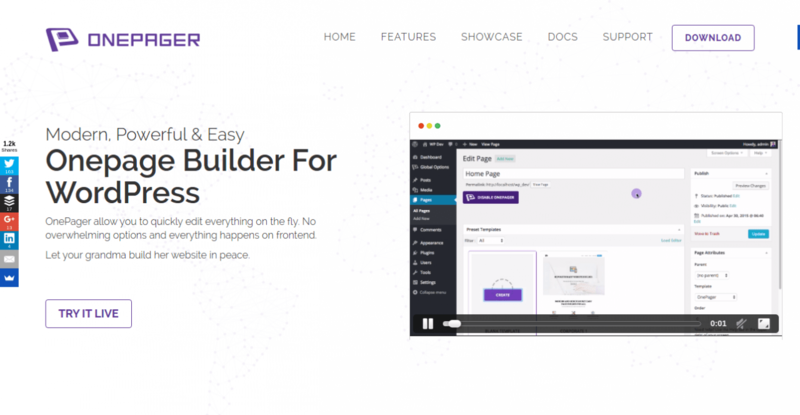 It is the the most minimalistic, simple yet very powerful page builder for WordPress. There is a lot of page builders in the marketplace, so you might be thinking why to choose Elementor? Elementor comes with fantastic elements that lets you create stunning and unique layouts. You do not need any coding experience to use Elementor, you just drag & drop to build your desired website. All the changes you make to your site are shown in real time, you do not have to wait after applying your changes. The customization panel of elementor is very easy to use and it is compatible with any theme any page. If you feel the need of saving your layout and reuse it later, you can do it with Elementor. Elementor allows you to control every pixel and design the same way you had on your mind. Create your content with 400+ awesome icons,, 800+ google fonts, lucrative color pallets and much more. There is a lot of ready elements available with elementor, all you have to do is drag & drop then customize it on your own terms. There is all other functions and features that all other pagebuilder offers, are also available with Elementor. But the best part of Elementor is, Its Free & Open Sourced. So did you got the points to choose Elementor over other page builders? Try Elementor now and experience the best WordPress development experience. 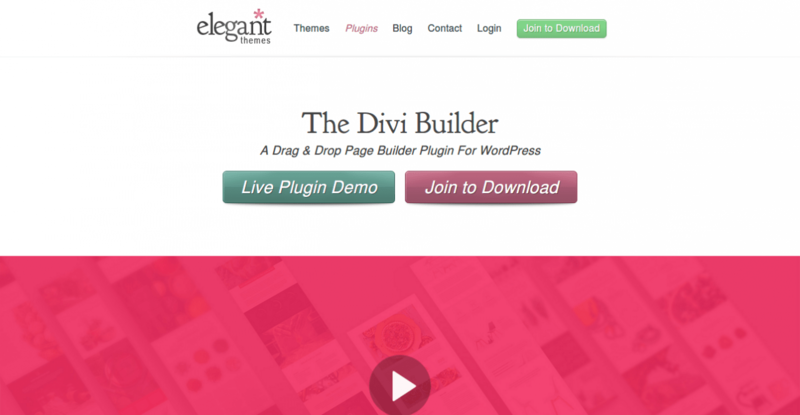 The Divi Builder is an elegant and Free page builder by ElegantThemes. The builder has been programmed with module-based system with a draggable canvas playground. When you drag any module into the Canvas, it allows you to resize or rearrange them visually with an enriched drag and drop functionality. The modules of this plugin include slider, tab, buttons, toggle, boxes and more. The WordPress builder is minimal with features, If you can gain proficiency in using the plugins you can create any complex layout within couple of minutes. 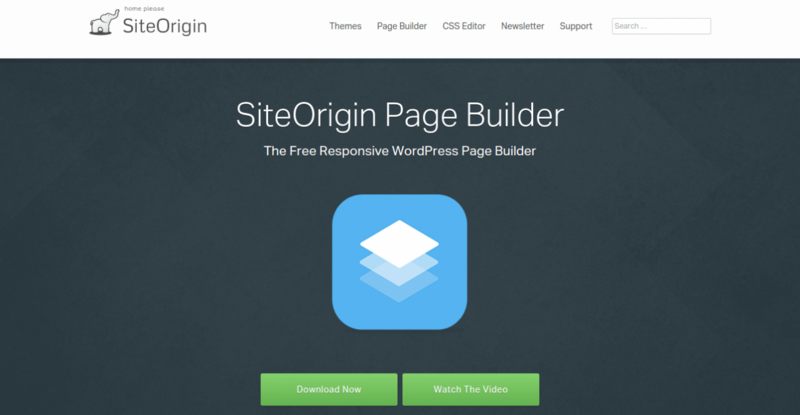 Page Builder by SiteOrigin is a revolutionary WordPress Page builder. The builder is available absolutely free of cost that allow to make a responsive grid-base page that can tailored with any screen no devices matters. Page builder by SiteOrigin can be categorized backend page builder plugins. Making pages with this builder is extremely easy, you can add your own galleries, images, self-hosted video, button, post, call to action, prices boxes, lists and a lot more. The amazing features of this Free WordPress page builder is light in weight. Every line and chunk of code has meaning, no exaggerated code has been included in. The WordPress front-end drag-and-drop page builder, Velocity comes with impressive opportunity sets, that doesn’t require programming knowledge. The builder has been crafted with the inline editing concept for WordPress with a great team headed by WordPress core developer, Mark Jaquith. The name of developers behind velocity haven’t pushed to the hype but it's outstanding and time saving features. Suppose you are writing a blog post, At the end you are having glance on the newly created post clicking on preview button. And it’s natural you may a find paragraph break, distorted image alignment or the formatting that you didn’t expect. What do you do in this circumstance? I bet you get back to admin panel to correct the errors, right? But but now you don’t need to do this. Velocity is here to save your time to commute between frontend and backend. You can correct or perform such task right from the front-end. Don’t believe me. Click on demo button below. 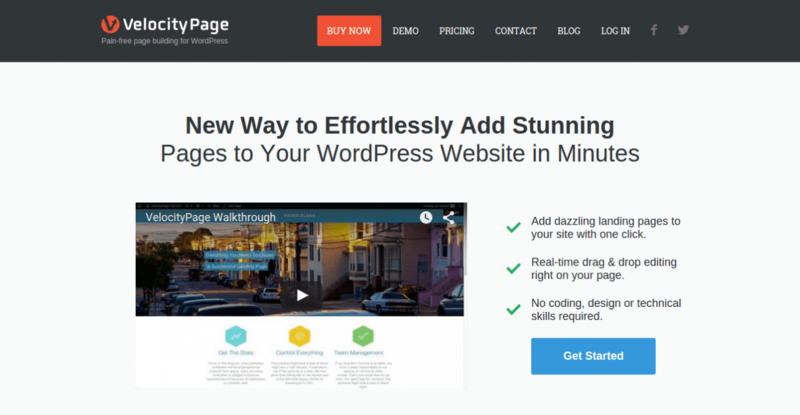 WP Page builder is an clean and easy to use drag-and-drop page builder. This builder is straightforward a tool, that enable you to instant WordPress page development within couple of click direct from the backend. Even maximum functional operation in WP Page Builder can be visualized because drag-and-drop functionality. The backend WordPress builder plugins are functional not only in post but pages with full control of its entire page elements. Built-in shortcodes, widget support and unlimited styling version to make your developing life a more easier. Aqua page Builder is another powerful Free page builder for WordPress. The drag-and-drop WordPress pages builder is notable amongst the developer because of its unlimited number of template variation for professional usage in WordPress themes. The amazing feature on this page builder plugin is user interface used by the Menus and Widget admin pages. So, If you are looking for a Website builder with WordPress support without spending money, Aqua page builder will give you the best. 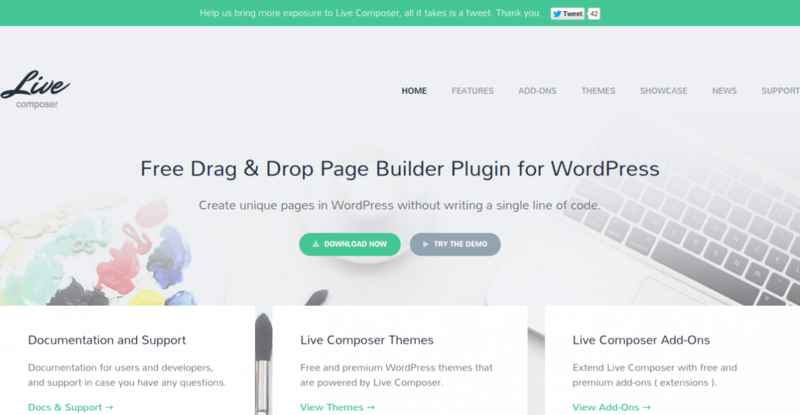 Live Composer is drag-and-drop frontend WordPress page builder, popular among the developers to create unique pages for you website directly from the frontend. With a nifty front editor, that generally loads in the each bottom of pages you can add style in you site pages, enable pre-built modules, and add entire content in your website. The Page Builder helps you to save your precious time, you can create a website that looks shining in every available devices within couple of hours. The distinguishing features of this WordPress page builder plugin comes with more than 30+ independent module including according post, galleries, tabs, slider, comment and lot more. Themify Builder is the most user friendly WordPress builder in available WordPress builders. The page builder is easy to use and work on, allows you to create any kind of layout that can imagine. The WordPress builder is perfectly suited for developer comes with facility with multiple site creation in couple of hours. 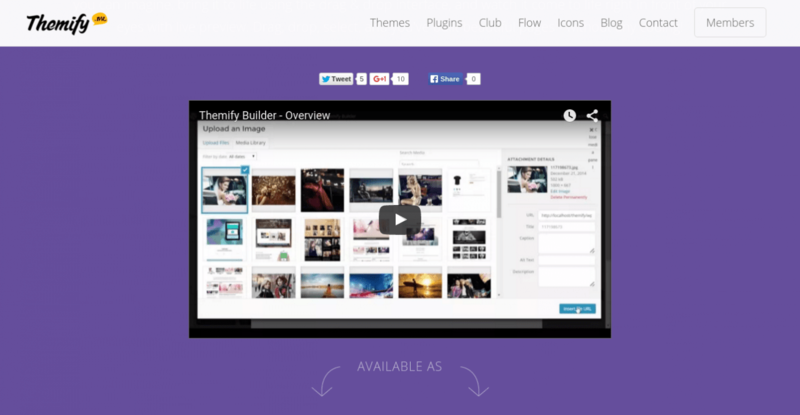 The Themify Builder plugin is design to make a website with drag-and-drop module brick. This page builder include images, accordion, divider, gallery, map, tab, slider, video and lot more. The builder is lightweight doesn’t superfluous scripts and component in the backend. Do you know why? It's every features are enabled with extendable extensions. If the existing module doesn’t satisfy your imagination, Themify provides a customs style functionality that allow to enable video background, parallax scrolling, Google fonts and more. Beaver Builder is another time-saving drag-and-drop page builder, comes with vast range of opportunity. The WordPress builder is bottled with numerous pre-built layouts and its variation. 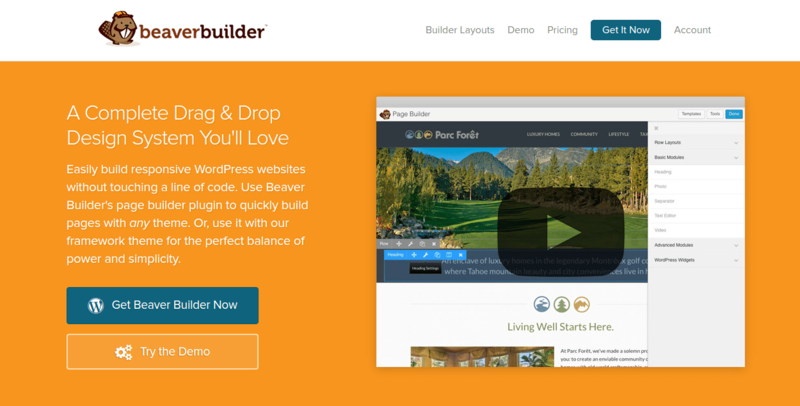 The Beaver Builder Page builder is standalone WordPress plugins, doesn’t need any theme dependency or other third party software. So, If you have a WordPress website running, need to make some awesome pages without touching single line of coding, that great. Beaver Builder give you an opportunity to add and edit page element with an frantic pace. Oh! I missed about its outstanding sidebar. It acts like Customizer of WordPress theme, that allow you to search for news and add them in the page like galleries, buttons, forms and more. We've created a well-curated list of Drag and Drop website Builder for WordPress. If you've further more experience of using other best WordPress builder plugins. Inform in the comment below. If you like you can check our list of Premium WordPress Templates, among these Edumodo, Academia and Switch Pro is most popular. We are looking forward for your comments. Ecommerce is on the raise with the growing potentials of digital selling, Simultaneously the number of Joomla eCommerce extensions have overwhelmed the market. In this competitive circumstance sometimes it becomes difficult and challenging for developers to find an appropriate eCommerce extension for their websites. To assist your choice and save your time, I’ve prepared a guide to help you to find the right eCommerce extension for your Joomla website. This article will comprehend the quick walk through the 5 popular Joomla eCommerce extensions in the Market. The primary focus of this article is to create a shrewd sense to justify extension price, support, compatibility of Joomla 3, and usability, so that you can choose the best one you need. Let’s dig in. VirtueMart is considered as the pioneer of the eCommerce extension in Joomla. Though Virtuemart took time to adopt new technologies, but has been captured the heart of Joomla developers for a decade, the reason is simple. Virtuemart is Open-Source easy to customize, comes with clearer architecture, more stable interface and effective performance. Virtuamart gives easy access to your shop and lets you customize with ease. If you are worrying about your new shop, than leave tension to Virtuamart and you do the relaxation. It doesn’t matter whether you are developing single language site or multi language site, as Virtuamart gives support for multilingual site as well. There is several payment options available now. Virtuamart gives you support of most popular payment options. Besides you will not have to worry about SEO, as Virtumart provides SEO support with meta tags. Your all ecommerce related problems will be solved with one simple ecommerce extension. So why not to choose it? If you fall in any trouble, the support community is always there to help you out. DigiCom is an another open-source and first Digital Commerce extension for Joomla. The key focus of this component is to provide such a software that enable you to quickly and easily setup your own marketplace in a minute. DigiCom is lightweight and user friendly, crafted with add-ons based structure meaning only install the add-ons according to your need. no more bloated code and features. DigiCom is specially designed to sell digital products comes with dedicated drag and drop file manager and a couple of payment integration. If you are looking for the endorsement to make your next website with DigiCom, I am glad to say ThemeXpert total digital selling system is running on DigiCom. No more fuss no more confusing, DigiCom is running in full swing with clean Dashboard and Sales analytics. Everyone chooses easiest and affordable way, hope you are not different. Choose Digicom and start selling your digital product with ease. Mijoshop is another leading eCommerce application for Joomla!, comes with a powerful shopping cart and eCommerce component that is crafted with feature rich and user friendly architecture. MijoShop was first appeared in Joomla Extension Directory in September 2012, but with continuous feature development and enhancement they have successfully grown their own realm of client-base. Though you can easily operate your digital store with Mijoshop, the extension is popular among site owners who sell tangible products. If you have willingness to sell product online and fond of intuitive admin interface that allows you to have complete control over your site with detailed sales report, MijoShop will get you along just fine. Mijoshop lets you these exclusive features only for $49 per 6 months. If you plan to buy it for lifetime, it will cost you $499 only. Hikashop is a powerful and easy to setup an use, comes with unlimited possibilities.Whilst it might not have as much functionality as other shop in this list. It is built for flexibility and simplicity. Frankly speaking when you are getting your eCommerce site build with HikaShop, you need to know a little bit CSS and HTML to beautify and tweak it around. But on top of that Hikashop is growing among the developer community, because of its covering huge features like multi-vendor, powerful analytics, responsive design, layout variation which reduce the usage and dependency of third party extensions. It provides currencies, languages, zones and taxes management as well as advanced customization capabilities of your shop in order to meet all ecommerce needs. Hikashop is a complete Joomla ecommerce plugin, which will let you have a full fledged online shop on your Joomla site just in minutes. j2Store is a lucrative webshop which comes with huge range of features. It provides superior access to any user to completely style around and change their website, without knowing HTML and CSS a lot. It has got a completely new and innovative approach for e-Commerce CMS, where others provide their own database with their own product pages, categories, etc. J2store is one of the free Joomla ecommerce extensions and requires no clumsy registration process. You can use articles as product, create product variants, define zone based tax rules, add advanced pricing by customer groups / quantity and do more. Everything you need in your online store can be set up with J2store. You get this amazing ecommerce extension at price of $0, but if you want to use pro version for 6 months you have to spend $49. redSHOP is an attractive Webshop packed with huge range of features, provide superior access to any user to completely style around and change their website, without knowing HTML and CSS a lot. The pricing structure is a little bit different comparing other eShop component in the market. The component has a basis paid package including the component, and can be extended with features by adding exactly what you need of the hundreds of modules and plugins. All extensions and redSHOP templates can be accessed with a Pro subscription. With just $49 you can get this joomla extension. Eshop is a responsive and very powerful Joomla ecommerce / shopping cart extension. This extension is built based on standard Joomla MVC structure with lots of great features. The speciality of this extension is - there is no complexity. Everything is kept so simple in Eshop, you just install and add products. Create your own categories, product pages, etc with this extension and make your online shop bigger. You will need only $39.99 to buy this Joomla Shopping Cart extension and enjoy its amazing features. We have listed the product according to our experience. If you find others extension amazing just inform us we, will add your desired on in this this list of best Joomla eCommerce extensions. Don't forget to share which Joomla eCommerce extension you guys are using for your online shop.